Most National Socialist homicidal gassings were supposedly committed with Diesel exhaust rather than cyanide or Zyklon B. Although this is contrary to popular perceptions about the Holocaust story, Diesel exhaust has been dominant, at least in terms of numbers of victims, in the claims of holocaust scholars since the 1960's. The Diesel allegations did, however, gain some public notoriety with the prosecution of American citizen John Demjanjuk. Demjanjuk was accused of having murdered at least 875,000 Jews with Diesel exhaust at the alleged extermination camp at Treblinka in 1942/43. An nationally syndicated essay from one of America's best-known newspaper columnists Patrick Buchanan raised the subject of Diesel gassing to a fever pitch in the American press. Buchanan, a former assistant to President Ronald Reagan, claimed that Diesel engines could not kill at all. His sweeping statement, which was far too broad, brought him massive criticism but not for any valid technical reasons. For readers familiar with auto emission issues, much of what follows represents a kind of 'overkill' and rightly so. But in order to put the Holocaust monster to its final, well-deserved rest - at least its Diesel portion - one must be rigorous and even exhaustive. Since Diesel gassings are not technically impossible, we must actually show how it could have been done hypothetically, and then, just how thoroughly unreasonable it is to believe the National Socialists would have ever used the necessary technology. In any event, according to my conviction, National Socialist homicidal gassings never happened! In any trial of even the most ordinary murder, one can expect an abundance of information about the murder weapon. One would expect the Allied and German post-war trials about murder as novel and as bestially spectacular as the mass murder of millions of Jews in gas chambers to provide the most extensive and precise documentation possible. Although there is a vast literature based primarilyon those trials, as far as the actual mechanics of the extermination process are concerned, all one really finds is an occasional short and vague description. Nearly sixty years have elapsed since the end of World War Two. The Holocaust specialists have had more than enough time to examine documents and alleged mass murder sites as well as testimony from the most extensive trials in the entire history of the world. Throughout this period they have been extremely active - but aside from a few bits and pieces of so-called 'confessions' and 'eyewitness testimony,' they have found next to nothing. The vast information gaps about the actual mechanics of the alleged extermination process should arouse the gravest suspicion. Although the information gaps are bad for the exterminationist position; what is even worse is that the few bits and pieces of information are simply incredible. To characterize the alleged mass murder methodology as 'hare-brained,' 'crackpot,' or 'weird' is to understate the situation. If one looks at the claims critically, sooner or later it becomes obvious that the people who repeat the Holocaust story in one form or another simply have no idea as to what they are talking about. The testimony of so-called 'eyewitnesses' is especially weird. The statement by Kurt Gerstein, which for a long time was the evidence most often used by Holocaust specialists, is the best example qualitatively. The other 'statements' or 'confessions' are even worse. The absurdities of the various alleged extermination methods do not in and of themselves prove that the Holocaust did not happen, but they should at least persuade reasonable people to ask for some strong corroborating evidence. There are, for example, no autopsy reports of gassing victims. The 'gas chambers' of Treblinka, Belzec and Sobibor were all allegedly destroyed before the war ended. Those in Auschwitz and Majdanek as well as those in the camps in the Reich proper are ordinary rooms (mortuaries, shower rooms, delousing chambers) that have been mislabeled 'gas chambers' in spite of their obvious design and function - often to keep people alive. To concoct horrible but conveniently vague 'eyewitness' accounts of mass murder is easy. To have such tales accepted about a defeated enemy nation after a brutal war, during which the vast media resources of the victors had already succeeded in portraying the enemy as thoroughly depraved and wicked, is also easy. On the other hand, it is not at all easy to explain how one could possibly commit mass murder with Diesel exhaust. The exterminationists have never provided the necessary explanation, not even in the great Israeli show trial of Ivan Demjanjuk, where precisely such an explanation of the Diesel-murder-method should have been demanded - at least by the defense. Table 1 is from The Destruction of the European Jews by Raul Hilberg and was published in 1961. The table summarizes the views of practically all generally accepted 'consensus' writers on the Holocaust story over the last 40 years. The camps listed are the only ones still regarded as 'extermination' camps. The fourth column from the left shows that in almost all of the camps, the killing operation supposedly used carbon monoxide (CO). In Auschwitz the killing operation supposedly used only hydrogen cyanide (HCN). Of the five camps where carbon monoxide was supposedly used, the vast majority of victims are said to have been killed in just three camps: Treblinka, Belzec, and Sobibor. The carbon monoxide was supposedly generated by Diesel engines. The number of Jews supposedly killed in Kulmhof (Chelmno) or Lublin (Majdanek) are small compared to the numbers for Treblinka, Belzec and Sobibor. The gas vans supposedly employed in Russia also used Diesels. On the basis of generally accepted numbers of victims, nearly two-thirds of all the alleged Jewish victims of German gas chambers were supposedly gassed with Diesel exhaust. *Updated figures were added here; cf. the appropriate notes. For at least several months in 1939 and 1940, Diesel engines had supposedly been used in Germany's euthanasia program to kill Germans who were feebleminded or incurably ill. The experience gained from this early use of Diesels was allegedly applied later by some of the same people, such as Reichsamtleiter Viktor Brack and Kriminalkommissar Christian Wirth, to kill Jews in Treblinka, Belzec, and Sobibor in eastern Poland. According to Hilberg, it was Wirth who constructed the "carbon monoxide gas chambers" for the euthanasia program on the orders of Brack who was "actually in charge of the [euthanasia] operation." Then in the spring of 1942, Brack ordered Wirth to Lublin where "Wirth and his crew immediately and under primitive conditions began to construct chambers into which they piped carbon monoxide from Diesel motors." In 1978 and 1979, major American television network NBC broadcast a four-day television miniseries entitled "Holocaust," which was essentially a dramatization of the generally accepted Holocaust story. There were several references to the use of Diesel engines for mass murder. In one scene, Dr. Bruno Tesch, who in real life had actually been a highly qualified chemist and was hanged after the war by the Allies, explains to Eric Dorf, a totally fictional SS officer administering the extermination program, that one of the advantages of Zyklon B over carbon monoxide is that Zyklon B "won't clog machinery - and there's no apparatus to break down, as in carbon monoxide." In another scene, Rudolf Höß, the commandant of Auschwitz, is about to start a Diesel engine when Eric Dorf explains to him that he will not need the Diesel any longer because he has ordered another substance, Zyklon B. Reality is rather different from what was suggested in the NBC miniseries and in some of the literature. The Zyklon B used in Auschwitz consisted of granules made of gypsum and starch, which certainly would have instantly clogged machinery and/or shower piping, although the cyanide gas released from Zyklon-B granules would not clog anything. Diesel exhaust does not clog machinery easily at all - unless the engine is making smoke under an extremely heavy. This smoke contains some solid matter which can, indeed, clog machinery (foul the cylinders), if there is more smoke than can be blown out with the exhaust. Otherwise, no clogging of cylinders occurs. The statement of Kurt Gerstein remains a major cornerstone of the Holocaust legend. Gerstein was an Obersturmführer (First Lieutenant) in the SS and a mine surveyor by profession with a graduate degree in engineering. When he surrendered to the French, he supposedly gave them a prepared statement dated April 26, 1945. He had been elevated to the status of "righteous gentile" by the Israelis and various Jewish writers for having at least tried to alert the world to the National Socialist extermination program. As H. Roques pointed out, six different versions of the Gerstein Statement have been found to date and published by various researchers often in grossly distorted and mutilated form. Many parts of Gerstein's statements range from the fantastically incredible to the downright impossible. He allegedly committed suicide in a French prison after having offered himself in vain as an informer to the French. The trend in recent years has been to dissociate from him as 'witness for the prosecution'. Nonetheless, his 'statements' are the only ones which give at least a few technical details about the alleged Diesel gassings. Raul Hilberg, for example, referred to his 'statement' many times without actually quoting from it. Then I understood the reason for the 'Heckenholt' sign. Heckenholt was the driver of the Diesel, whose exhaust was to kill these poor unfortunates. [] SS Unterscharführer Heckenholt tried to start the motor. It wouldn't start! Captain Wirth came up. You could see he was afraid because I was there to see the disaster. Yes, I saw everything and waited. My stopwatch clocked it all: 50 minutes, 70 minutes, and the Diesel still would not start! The men were waiting in the gas chambers. You could hear them weeping 'as though in a synagogue', said Professor Pfannenstiel, his eyes glued to the window in the wooden door. [] Captain Wirth, furious, struck with his whip the Ukrainian who helped Heckenholt. The Diesel started up after 2 hours and 49 minutes, by my stopwatch. Twenty-five minutes passed. You could see through the window that many were already dead, for an electric light illuminated the interior of the room. All were dead after thirty-two minutes! Jewish workers on the other side opened the wooden doors. They had been promised their lives in return for doing this horrible work, plus a small percentage of the money and valuables collected. The men were still standing, like columns of stone, with no room to fall or lean. Even in death you could tell the families, all holding hands. It was difficult to separate them while emptying the room for the next batch. The bodies were tossed out, blue,[] wet with sweat and urine, the legs smeared with excrement and menstrual blood." It is physically impossible to crowd 700 to 800 people into a space of only 25 square meters, i.e., 28 to 32 people per square meter. According to Gerstein, it was not a peephole through which Professor Pfannenstiel supposedly looked into the gas chamber - it was a window in a wooden door, and not a gas-tight, panic-proof steel door as one might expect. Supposedly, there were wooden doors on two sides of at least one of the gas chambers. We are told that the intended victims were still alive after almost three hours in the gas chambers before the Diesel even started, so there must have been many air leaks into the chambers or else the Jews would have been asphyxiated without the aid of any Diesel. There is no mention anywhere of the intended victims trying to break out. Wooden doors with glass windows would hardly have withstood a determined group effort to break through. Surely, Prof. Pfannenstiel, with "his eyes glued to the window," would have noticed if some people had been trying to smash the glass. But no, we are told instead that the victims were calm enough and reflective enough to form groups of family members, and hold hands, and even weep. More than likely, Dr. W. Pfannenstiel, Professor of Medicine at Marburg, had been sent to Belzec and other camps as medical adviser to improve hygiene and health care in the camps. After the war, he was repeatedly interrogated regarding his visit to Belzec with Gerstein. He was charged in two cases but never convicted. In the court-room statements, which are available to us, he never directly disputed Gerstein's account, but in a private letter he described the Gerstein Statement as "highly dubious rubbish in which 'fantasy' far outweighs fact." He also wrote that due to the persecution and slander to which he was exposed, he did not wish to comment further on the matter publicly. In other words, Pfannenstiel had clearly tried to avoid further trouble for himself. The 'whole truth' would have been too much for his prosecutors to bear. According to the last sentence of the Gerstein text quoted above, the bodies of the victims were "blue." Here we have a major flaw as far as the death-from-carbon-monoxide theory is concerned because victims of carbon monoxide poisoning are not blue at all. On the contrary, victims of carbon monoxide poisoning are a distinctive 'cherry red' or 'pink'. This is clearly spelled out in most toxicology handbooks and is probably well known to every doctor and to most, if not all, emergency medical personnel. Carbon monoxide poisoning is actually very common because of the automobile and accounts for more poison gas injuries than all other gases combined. The Gerstein statement, to its credit, does not claim that carbon monoxide was the lethal ingredient in the Diesel exhaust. It is the post-war exterminationists who insist that death was due to the carbon monoxide in the Diesel exhaust. The recurrence of references to "bluish" corpses in several other examples of so-called 'eyewitness testimony' from West German trials merely demonstrates the 'copy-cat' nature of much of that testimony. That such testimony has been accepted by West German courts specializing in Holocaust-related cases and by the Holocaust scholars, apparently without any serious challenge, merely demonstrates the shoddiness of those trials and the pseudo-scholarship which pervades the subject in general. If the corpses had indeed appeared "blue," death certainly would not have been due to carbon monoxide poisoning. A bluish appearance could, however, have been an indication of death from asphyxiation, i.e., from lack of oxygen..
"[...] there is little to add to this description [the Gerstein Statement], which holds good for Treblinka and Sobibor as well as for the Belzec camp. The latter installations were constructed in almost the same way and also used the exhaust carbon monoxide gases from Diesel motors as death agents." According to Poliakov, more than a million and a half people were killed with Diesel exhaust. How much carbon monoxide is actually needed to kill a human being in half an hour? Does Diesel exhaust ever contain that much carbon monoxide? Carbon monoxide poisoning has been thoroughly studied since about 1920 when it was carefully examined to determine the ventilation requirements of tunnels for motor vehicles, particularly for the Holland Tunnel in New York City. Since the early 1940s, it has been widely accepted on the basis of the research of Yandell Henderson and J. S. Haldane that given a normal oxygen content of the air, an average carbon monoxide concentration of "0.4% and above," as shown on the last line of Table 2, is needed to kill people in "less" than one hour of continuous exposure. Concentrations of 0.15%/vol. to 0.20%/vol. are "dangerous," which means they might kill some people in one hour, especially if those people have, for example, weak hearts. But, to commit mass murder in a gas chamber one would need a concentration sufficient to kill not merely a portion of any given group of people but rather, sufficient to kill all. The prospect of 'survivors' of a gassing being 'regassed' later on or disposed of in some other way is too ridiculous. The vagueness introduced by Henderson's use of the term "less" is unfortunate. It arises from the fact that although Henderson and others could test for non-lethal effects in a laboratory with a high degree of accuracy, the lethal effects could not be tested in the same way. The lethal effects and the corresponding CO levels were determined by careful extrapolation of carboxy-hemoglobin levels over time from non-lethal tests on humans as well as from some lethal tests on animals. Although the concentrations given for lethal effects are not as precise as one might wish, they are still sufficiently accurate to support some important conclusions about Diesel gas chambers. According to the exterminationists, the gassing was always done in about half an hour or less. %/vol. CO � exposure time = Constant for any given toxic effect. In other words, for any given toxic effect, the poisonous concentration must be inversely proportional to the time of exposure. This means that to kill in half an hour, one needs twice the concentration that one would need to kill in a full hour. Applying this rule to the '0.4% and above' needed to kill in "less than 1 hour," we get 0.8%/vol. as the minimum concentration needed to kill in less than half an hour. Applying the same rule to the 0.15 to 0.20%/vol. range, which is "dangerous" for one hour of exposure, we get 0.3%/vol. to 0.4%/vol. as the range of CO concentration, which is dangerous for half an hour of exposure. What all this means is that to have any kind of practical gas chamber using carbon monoxide as the lethal agent, one needs an average concentration of at least 0.4%/vol. carbon monoxide - but, possibly as much as 0.8%/vol. We should keep '0.4% to 0.8%' in mind as benchmark numbers to which we will refer shortly. Please note that these data hold true only in the presence of a normal oxygen content of the air! Graph 1: Toxic effect of small amounts of carbon monoxide. Top: original chart; left: additional values extrapolated by the author. Another important consideration is always the average concentration over the entire time of exposure, and not some quantity of poison measured in pounds or cubic feet. In our current discussion, this is a problem, since to determine the concentration one would like to know the volume of the gas chamber which is not really possible here due to the general lack of information. Neither is it possible to solve this problem by determining an absolute quantity of poison instead of a concentration value. The few data regarding gas chamber size, which we do have for example from the Gerstein Statement, are so unbelievable that there is no point in trying to work from them. But we do know that the average CO concentration will always be less than the CO concentration measured directly on the exhaust side of the Diesel engine. Table 3 shows the Hb� CO levels of carbon monoxide victims from the 1950s. In the literature of toxicology, 60% Hb� CO is generally cited as the fatal level (cf. Graph 1). According to Table 3, more than 1/4 of all people would be dead at this concentration. Almost another 50% die at levels up to 70% Hb� CO, and the last quarter would die only when the concentration had increased to 80% Hb� CO (see also the scattergram Graph 2). So, to build an effective CO execution gas chamber which, in keeping with eyewitness testimony, kills everyone within half an hour - even young, healthy people with good nerves - the chamber would have to reliably induce a level of 80% Hb� CO. An average CO content of 0.4% by volume in the gas chamber air would be the absolute minimum required (cf. Graph 1). Graph 1 gives the symptoms from various low-level carbon monoxide exposures as a function of duration of exposure. The highest CO concentration discussed is 600 ppm (parts per million). 600 ppm is another way of saying 0.06%/vol. The chart shows that after one hour of exposure to an average concentration of 600 ppm of CO, one would experience a headache, but not a throbbing one. Even after 100 hours of exposure, the worst that one would experience would be unconsciousness, but not death. However, after only half an hour of exposure to 600 ppm, no symptoms are indicated at all - not even a mild headache. We should keep '0.06%' in mind as another benchmark number to which we will refer later in this chapter. To obtain more reliable data about the effects of a higher CO content in exhaust than those extrapolated here, one can consult accident and suicide statistics. Accident or suicide victims who died from carbon monoxide are frequently tested for the carboxy-hemoglobin (Hb� CO) concentration in their blood. What any would-be National Socialist mass murderers needed to achieve with their gas chambers is called by toxicologists the "LD100," the lethal dose for killing 100% of the victims. The concrete implications of this can be seen from the statistical analysis of a study of 100 deaths from carbon monoxide poisoning. Although information as to engine type and size might be considered essential in the investigation of any ordinary murder, such details are just too much to expect when one is dealing with the Holocaust hoax. Without more specific information, we must investigate the broader and far more difficult question of whether or not any Diesel ever built could possibly have done the abominable deed. The most frequent claim, however, is that the engines were Diesels from Soviet tanks. If Gerstein had claimed that the carbon monoxide was generated by gasoline engines, his story would be more credible. Gasoline engines can indeed kill rather easily and with little or no warning because their exhaust is almost odorless. Although Diesel engines look like gasoline engines, at least to most people, they are actually quite different. Any mining engineer or mine surveyor, such as Gerstein was, should certainly have been able to easily distinguish between the two types of engines. For one thing, the sound of Diesels is so distinctive that almost anyone can with a little experience recognize them with his eyes closed. When Diesels are running, they actually warn us of their presence: their exhaust smells terrible. In other words, every Diesel engine comes with its own built-in 'warning ingredient.' The intensity of the smell or stench has, no doubt, given rise to the thoroughly false impression that Diesel exhaust must, therefore, be very harmful. The simple-minded but false logic which guides Holocaust believers is that, since gasoline engine exhaust can certainly kill, even though it has little odor, Diesel exhaust, which has an intense odor, must be extremely deadly. The fact is, however, that there is absolutely no relationship between smell and toxicity since the most lethal ingredient by far is CO which is totally odorless. Although Diesel exhaust is not totally harmless, it is one of the least harmful pollutants anywhere except for some possible long-term carcinogenic effects, which are totally irrelevant for any gas chamber for mass murder. Diesel emissions have until recently been well within the air emission standards of the U.S. Environmental Protection Agency without any modifications or accessories. However, concerns over cancer from Diesel exhaust have made the issue quite complicated in recent years, but those concerns are only for long-term effects. In any event, Diesels have always produced far less than 1%/vol. carbon monoxide, which is still the CO standard for all internal combustion engines. Gasoline engines have only met the same standard after many years of intensive research and the addition of many engine modifications and complex accessories including catalytic converters. Graph 3 compares carbon monoxide emissions from Diesel and gasoline engines. The latter are also called spark ignition engines because they use spark plugs. Clearly the logical choice between the two types of engines as a source of carbon monoxide would always have been the gasoline engine. From spark ignition or gasoline engines, one can easily get 7%/vol. carbon monoxide - and with maladjustment of the carburetor, as much as 12%/vol carbon monoxide - but from Diesel engines one can never get so much as 1/2 %/vol. with liquid fuels, except during overloading. Carbon monoxide emissions from internal combustion engines are commonly plotted as functions of air/fuel ratio or fuel/air ratio. Fuel/air ratio is merely the reciprocal of air/fuel ratio. It has generally been accepted by the automotive experts that the CO level of Diesel exhaust is related chiefly to these ratios and not to other factors, such as rpm. An air/fuel ratio of 100:1, for example, means that for every pound of fuel burned, 100 pounds of air are drawn into the engine. However, only about 15 pounds of air can ever react in any way chemically with each pound of fuel regardless of the air/fuel ratio or even the type of engine. This means that at an air/fuel ratio of 100:1, there are always about 85 pounds of air which do not react. These 85 pounds of excess air are blown out of the engine without undergoing any chemical change at all. As far as the excess air is concerned, the Diesel engine is nothing more than an unusual kind of blower or compressor. In addition, there are no adjustments that one can make on a Diesel to mistune the engine to change the exhaust emission levels. Gasoline engines always operate with an air deficit. As a direct result of this deficit, the combustion process in gasoline engines can not possibly go to completion; a significant proportion of carbon monoxide to carbon dioxide will always be formed. Diesels by contrast always operate with excess air. At idle, Diesels operate with air/fuel ratios as high as 200:1. At full load, the air/fuel ratio is still only down to 18:1. Because of the abundance of air, there is always far greater opportunity for the fuel to burn to completion, thereby producing hardly any carbon monoxide. What little carbon monoxide is produced in the cylinders of a Diesel is subsequently diluted even further by the excess air. Each cylinder of a Diesel either misfires or fires. If a cylinder misfires, the fuel will simply be blown out as vapor and produce no CO at all. When it does fire, the fuel will always burn to near perfection because of the excess air which is always present. Maladjustment, or faulty injection timing, or defective valves have no significant effect on CO levels for the same reason: the excess air reacts with nearly all of the remaining CO to form carbon dioxide. As soon as one understands the true differences between Diesel and gasoline engine combustion, the logical choice as a source of carbon monoxide will always be the gasoline engine. The Diesel engine is always an inherently ludicrous choice as a source of carbon monoxide. There are basically two types of Diesel engines: divided combustion chamber and undivided combustion chamber. The divided chamber category of Diesel engines is generally subdivided into pre-combustion chamber designs and turbulent cell designs. Graph 4 shows a pair of emission curves for Diesels with divided combustion chambers (Engine A and B). These curves were the result of exceptionally careful tests made in the early 1940s in the United States by the U.S. Bureau of Mines (USBM) to determine whether or not Diesel engines could operate underground without endangering miners. The conclusion of the USBM had been, at least until the 1970's energy crisis, that Diesels could operate underground in non-coal mines subject to USBM approval of the engines. Today, Diesels are also widely used in U.S. coal mines. The earlier exclusion of Diesels from US coal mines had nothing whatever to do with health and safety considerations, but job security for coal miners and the political persuasiveness and eloquence of John L. Lewis, the charismatic president of the miners' union who had insisted: "no Diesels in UMWA mines." The lower curve in Graph 4 is for a pre-combustion chamber Diesel (Engine A). The upper curve is for a turbulent cell Diesel (Engine B). The lowest fuel/air ratio always corresponds approximately to idle and a 'no-load' condition. At idle, neither of these types of Diesels could produce enough carbon monoxide to even give a headache after half an hour of continuous exposure. As one starts to impose loads on these engines, and in effect increases the fuel/air ratios, the carbon monoxide levels actually decrease at first. Only as one approaches full load, represented by the solid heavy line in the figure, do the carbon monoxide levels rise significantly to a maximum of 0.1%/vol. at a fuel/air ratio of 0.055. The solid vertical line represents the safe maximum set by engine manufacturers. The emission curve in Graph 5 (Engine C) shows that an undivided chamber Diesel still produces only about 0.03%/vol. carbon monoxide at idle, which is not enough to cause a headache in half an hour. However, as increasing loads are imposed on such an engine, the carbon monoxide levels do eventually rise rather sharply. At full load, represented by the heavy vertical line, the carbon monoxide level is indeed at about 0.4%/vol. In other words, here we have a Diesel which looks as if it could have been used to commit mass murder in half an hour. The problem for this engine, and for all Diesels, is that to operate at full load continuously for long periods, such as half an hour, one risks fouling and damage from accumulated solids inside the cylinders. If one operates at lower and safer fuel/air ratios than 0.055 (air/fuel ratio 18:1), that is with lower loads, the carbon monoxide emission levels drop very dramatically. For example, at 80% of full load, which is generally regarded as the safe maximum for continuous operation and which occurs at a fuel/air ratio of about 0.045 (air/fuel ratio @ 22:1), the carbon monoxide level is only 0.13%. That the emission curves in Graphs 4 and 5 are indeed typical of all Diesel engines over the last sixty years is attested to by the fact that these particular curves have been referred to in countless journals and books on Diesel emissions. In other words, there are no better examples of Diesel emissions. To be sure, there are many other test results in reputable automotive engineering journals such as the Society of Automotive Engineers Transactions. But if one takes the trouble to look through the SAE Transactions of the last sixty years as well as through other journals, one will not find any examples of worse carbon monoxide emissions than the curve in Graph 5 for engine C. Our analysis of engine C represents the worst case that anyone is likely to find anywhere, for any Diesel engine. One might think that all one has to do to get a high fuel/air ratio is to press the fuel pedal to the floor - without any external load being coupled to the engine. What happens then, as the fuel pedal is simply pressed 'to the metal,' is that the fuel/air ratio will indeed go to the maximum that the fuel injection stop setting will allow and, because of that, the engine speed will rapidly increase as well. Within a few seconds, the engine speed will approach the maximum safe engine speed set by the manufacturer. Long before that speed is reached, however, an internal speed governor in the fuel injection pump assembly will restrict the fuel supply - and quite severely - to protect the engine by ensuring that the maximum safe engine speed or 'redline' speed is never exceeded. The actual fuel/air ratio at 'high speed idle' will stabilize after a few seconds, since there is no load, to nearly the exact same low fuel /air ratio as at 'low speed idle.' At high speed idle, more fuel will be consumed per second, but because more air is also being drawn into the engine, the fuel/air ratio will remain nearly the same as at low speed idle. In other words, pushing 'to the metal' without an external load will not raise the fuel/air ratio, except initially. To actually maintain a high fuel/air ratio for more than just a few seconds, either of two methods, or a combination thereof, is essential. One method involves coupling a load, such as a pump, fan, or generator to the engine to hold the engine speed safely below the 'redline' speed. Another method is by 'choking,' which means restricting the air supply to the engine. As a practical matter, coupling an external load to an engine in a typical truck or tank is far from easy. Nothing like it is even remotely suggested in any of the anecdotes or documents anywhere in the Holocaust literature. This method will be investigated more closely in section 8.1. Reducing the air intake, however, is quite easy, but experiments have shown that this method still does not meet the necessary requirements, see section 8.2. Is it possible that the Jews died from reduced oxygen in the Diesel exhaust? Such a theory would at least be consistent with the claim that the corpses were "blue." A bluish coloring to certain parts of a corpse is indeed a symptom of death from lack of oxygen. Normal air contains 21%/vol. oxygen. In Graph 6 we see that the oxygen concentration corresponding to idle in the exhaust of any Diesel engine (divided or undivided chamber), shown at the right in the graph at an air/fuel ratio of 100:1 (fuel/air ratio 0.01), is 18% which is just a few percent less than one finds in normal air. At full load0 (fuel/air ratio 0.055), the oxygen concentration in the exhaust of any Diesel engine is approximately 4%. Probably the best discussion of the effects of reduced oxygen levels, or asphyxia, is provided by Henderson and Haggard, according to whom an oxygen content of less than 10%/vol. causes loss of consciousness, and an oxygen content of less than 6%/vol. is fatal. According to Haldane and Priestley, "air containing less than 9.5 per cent of oxygen would ordinarily cause disablement within half an hour." But disablement is still not death! Clearly, there is no magic number below which death would automatically occur, or above which life would necessarily continue. However, for any gas chamber relying upon reduced oxygen as the killing method, one would have to reduce the oxygen to below 9.5%/vol. and perhaps even below 6%/vol. From Graph 6 we see that to reduce the oxygen concentration in the exhaust to just 9%, any Diesel would have to operate at a fuel/air ratio of about 0.04, which corresponds to roughly 3/4 of full load. To reduce the oxygen concentration to as low as 6%, a Diesel would have to operate at close to full load. In other words, any Diesel gas chamber relying on the reduction of oxygen as a killing method would have to operate at more than 3/4 of full load. From the above it is evident that over most of their operating ranges, Diesels discharge sufficient oxygen so that one can literally inhale pure Diesel exhaust and survive. The smell will be brutally unpleasant, but not harmful. From idle to at least 3/4 of full load, Diesel exhaust contains sufficient oxygen to sustain human life for at least half an hour. Table 4 shows carbon monoxide levels for various load ranges of the Diesel with the worst emission values, i.e., Engine C from Graph 5. When dividing the actual O2 content in the exhaust by the normal oxygen content in air (21%), one gets a factor FO2. One can then multiply the actual CO content by this factor to determine the toxicologically effective CO content (see section 5). Table 4 shows us that the desired, high effective CO content that guarantees the death of all the victims within half an hour (0.4 to 0.8%) can only be attained near full load. If Jews were not killed with carbon monoxide or from a lack of oxygen, could they have died instead from the effects of carbon dioxide? Carbon dioxide is no more poisonous than ordinary water. Most toxicology handbooks do not even mention it. When mentioned at all, it is generally classified as a "non-toxic, simple asphyxiant." There are, however, occasional accidental fatalities where carbon dioxide is directly involved. Death in almost all such cases is caused by a lack of oxygen. The lack of oxygen arises from the fact that the carbon dioxide is much heavier than oxygen and will, especially in an enclosed space, displace oxygen in the same way that water will displace air in the lungs of a drowning man. The actual cause of death in either situation is not the carbon dioxide or the water, but rather the lack of oxygen in the blood (suffocation). One symptom of this kind of death is a bluish appearance of the skin. Carbon dioxide can be beneficial and therapeutic. It is commonly used in clinical medicine as a harmless stimulant for respiration. For this purpose it is supplied under pressure in cylinders (Carbogen) containing oxygen and 7%/vol. carbon dioxide. Normally, when a person exhales, the air leaving the lungs contains about 5.5%/vol. carbon dioxide. Levels of 3%/vol. carbon dioxide are quite tolerable for exposures lasting several days. For example, in the 1950s the U.S. Navy experimented with gas mixtures containing 3%/vol. carbon dioxide and 15%/vol. oxygen (25% less oxygen than in normal air), for use in American submarines with exposures lasting up to several weeks. For Diesel engines, the carbon dioxide level at or near idle is only about 2%/vol. and gradually increases to about 12%/vol. at full load as shown in Graph 6 (page 448). A carbon dioxide level of 12%/vol. may cause cardiac irregularity and may, therefore, be dangerous for people with weak hearts. In contrast to Diesels, gasoline engines produce 12%/vol. already at idle. In general, if enough oxygen is available, a carbon dioxide level even as high as 12%/vol. is not likely to cause death. It is generally accepted that only carbon dioxide concentrations greater than 20 to 30%/vol. are dangerous. However, when the carbon dioxide level is as high as 12%/vol. in Diesel exhaust, the corresponding oxygen level is dangerously low. The principal danger to life from Diesel exhaust arises not from any secondary components, but strictly from the combined effects of CO and reduced oxygen. Other pollutants in Diesel exhaust, besides carbon monoxide, are primarily aldehydes (OCHR), sulfur dioxide (SO2), nitrous oxides (NOx, max. 0.1%), and hydrocarbons (CxHy). The smell or stench for which Diesel engines are notorious is caused by trace amounts of certain hydrocarbons and aldehydes which the most modern analytical instruments can barely identify, let alone measure. The sensitivity of the human nose to these compounds is, however, extremely high and out of all proportion to the actual quantities present. Some of the hydrocarbons are considered carcinogenic and thus represent a potential long-term hazard, but they are irrelevant to our study. The sulfur dioxide content of the exhaust, which can be fairly high for sulfurous fuels, causes irritation of the respiratory tract, but these irritations cannot become critical within the time frame at issue here. Nitrogen dioxide (NO2), if present in high concentrations, can cause edema of the lungs after half an hour's exposure. However, even the worst edema will not kill in half-an-hour, but only after a delay of about 24 hours. One-time, brief exposure to lower concentrations of NO2 merely irritate the lungs and mucous membranes, as do any sulfur oxides potentially present, so that we need not consider them further. Nitrogen monoxide (NO), on the other hand, has physiological effects similar to CO. Unlike CO, however, its concentrations decrease with decreasing oxygen concentrations in the combustion process, i.e., with higher load, and do not attain any levels critical to health. Furthermore, NO converts rapidly to NO2, so that the NO concentration enhances the effects of the CO in the exhaust only imperceptibly. The peroxide (ozone) forming effects of nitrous oxides near ground level as well as the carcinogenic components of Diesel exhaust are the reason Diesel engines have recently also been subjected to special emission guidelines. They supposedly pose a danger to human respiration. This is why the studies conducted in Germany of health hazards posed by Diesel exhaust were almost entirely confined to analyses of the proportions of smoke solids and non-combusted hydrocarbons. Diesels tend to smoke, especially under heavy load. This is not due to any inherent inefficiency of Diesels. On the contrary, Diesels are extremely efficient. The smoke is the result of the nature of Diesel combustion and the heavier fuels which Diesels use compared to gasoline engines. The solid heavy lines in Graphs 4-7 represent the smoke limit that manufacturers have found necessary to protect their engines from excessive wear. As a practical matter, a Diesel cannot operate to the right of the vertical lines in Graphs 4 and 5 (fuel/air ratio of 0.055 = air/fuel ratio of 18:1) with liquid fuels because the internal accumulations of smoke solids would destroy the engine within a short time and would stall the engine. Many manufacturers are more conservative and limit their engines to fuel/air ratios below 0.050. Diesel engines can operate safely at fuel/air ratios above 0.055 (air/fuel ratios below 18:1) only if they are burning a clean, gaseous fuel. This is the only way to avoid the buildup of solid material within the cylinders. The data shown to the right of the vertical line were only gathered because the researchers at the USBM chose to test their engines for theoretical reasons with gaseous fuel far beyond the normal (manufacturer recommended), full load settings of the respective engines. The data for clean, gaseous fuel is irrelevant to our analysis because if the Germans had had a gaseous fuel for the Diesel engines - for example, pure CO - they could have sent that gas directly to the gas chamber. Using a Diesel engine as some kind of intermediate step would have made no sense; it could only have made the gas far less toxic. Since carbon monoxide is highly combustible and because of the excess air, practically all of the carbon monoxide going into the Diesel would have been consumed. Diesel smoke contains a liquid phase and a solid phase. The liquid phase generally gets blown out of the engine with the exhaust and, therefore, can do no harm to an engine. But if enough solid material is also produced, and rapidly enough, some of that material will accumulate in the cylinders where, in just a few minutes, it can severely damage piston rings and valves and even cause an engine to simply self-destruct and stop. The amount of solids produced by Diesel engines increases dramatically just above a fuel/air ratio of 0.055. For this reason, manufacturers as a rule equip the fuel injection pumps with stops so that the engines can only operate below 0.055, or even 0.050. Operating any Diesel engine near the maximum load recommended, regardless of the particular design or engine type, would have produced significant amounts of smoke. Smoke is generally also noticeable immediately after start-up, even at idle or under light load, when the engine has not yet had time to reach its normal operating temperature. Pattle et al. found that an engine running at less than half load and producing 0.22%/vol. CO also produces extremely pungent, tear-inducing smoke which, if piped into a gas chamber, would reduce visibility to a mere foot or so. It should surprise no one that there is no mention of smoke from the Diesel - black, white, dense or otherwise - anywhere in the Gerstein statement or in any of the postwar trial testimony. Can one really believe Jews locked in gas chambers would have patiently withstood such torture? The stench of Diesel exhaust is familiar to anyone who has ever driven a car behind a truck or bus anywhere in the world. That stench is, in effect, a powerful 'warning ingredient' to the presence of a Diesel engine - at least until recent years when the addition of catalytic converters and other equipment reduced the stench substantially. Ironically, it was the removal of a warning ingredient in Zyklon B in 1944 which some holocaust believers have often cited as 'proof' of a fiendish National Socialist desire to deceive intended victims. With Diesel exhaust, a technology to remove its warning ingredient simply did not exist until many years later - and yet, the National Socialists still supposedly used Diesels for mass murder instead of, for example, gasoline engines which have no such warning ingredient. In other words, the arguments about 'warning ingredients' in connection with the 'Holocaust' are at least as nonsensical as everything else. But in addition to smoke and smell, Diesel engines are notorious also for their intense noise and vibration. One might even say that the noise and vibration are additional 'warning ingredients.' Because of their higher compression ratios, lower rpm's, and the explosive type of combustion, the amount of vibration that Diesels produce is substantially greater than that of any comparably-sized gasoline engine. The noise and vibration are among the major reasons why Diesels have not generally been used in automobiles. They are just too noisy for many people to bear. If the 550 hp, V-12 cylinder Diesel from a typical Soviet T-34 tank had been mounted on the floor of a small building and run for half an hour at more than 3/4 of full load (at more than 375 hp), the noise and vibration would have been at least as noteworthy and as wildly spectacular as the wailing of any Jews - and yet, there is no mention of any such noise or vibration in the Gerstein Statement, or in any of the post-war trial testimony. Since tests with lethal emissions on humans are not possible, accidental human deaths have always been an invaluable, alternative source of information for toxicologists. Parts of underground mines can often become totally enclosed just like gas chambers from the inevitable accidents, especially roof failures, which often occur there. Gasoline engines have generally been outlawed for underground applications because of their notorious, toxic exhaust, but the history of Diesels underground is quite different. Diesel engines were first used underground in coal mines in 1928 in Germany, in the Saar region, and quite safely from all this author has seen in the excellent German literature on this subject, especially in the German mining journal Glückauf. In Britain, Diesels were first used underground in Yorkshire in 1939, more than ten years later, but in the following decades, thousands more were used throughout Britain. "Although it is accepted that there are potential hazards arising from the emission of noxious gases in the exhaust gases of Diesel engines, the degree to which these are controlled in British coal mines has proved to be very effective.. An examination of ALL safety records has revealed that no person has suffered any harmful effects either temporarily or permanently as a direct result of breathing any toxic gas emitted from any vehicle powered by a Diesel engine." Another quote from the technical literature summarizes much of what can be found there. The following is from an American essay by Dennis S. Lachtman, Director for Health Engineering for the EIMCO Mining Machinery company in a section subtitled: "NO significant human hazard seen in over 20 studies." "A number of studies evaluating human response to exposure of Diesel have included experience among Diesel bus workers, Diesel railroad workers, and metal and non-metal miners working with Diesel production equipment and underground. There are more than 20 human health studies involving working populations exposed to Diesel exhaust emissions. As can be seen from a careful review of these studies, NO SIGNIFICANT health hazards have been associated with exposures to Diesel exhaust emissions. More recently, the National Institute for Occupational Safety and Health (NIOSH) has reported on epidemiological studies it has performed in underground mines. One of these studies included an MSHA[] and NIOSH joint study of the relationship between the underground environments in 22 metal and non-metal mines looking at the health of more than 5000 miners. This comprehensive study focuses on the health effects of both silica dust and other substances including those found in Diesel exhaust. [...] The researchers reported that the data showed an ABSENCE of harmful effects from Diesel exhaust." There was not even one injury from Diesel exhaust. No doubt, there must be some occasional deaths somewhere in the world, but they are certainly few and far between. This does not prove that Diesels cannot be used to commit mass murder, but it is all the more reason to believe that murder with Diesel exhaust is far from easy. The only evidence of Diesels having ever been used anywhere, anytime for murder in all of human history is within the 'Holocaust' claims and there the best evidence by far is the Gerstein statement. The fact that the general non-toxicity of Diesel exhaust was rather well known in the pre-WW2 German mining industry and the fact that Kurt Gerstein had been trained as a mine surveyor with, no doubt, some practical experience in German mines suggest that his obviously concocted 'statement' near the end of the war may have been deliberately constructed around Diesel exhaust so that what would seem at first glance to be a highly incriminating eyewitness account would eventually, long after the war, be recognized as worthless. Every year, thousands of deaths occur worldwide due to carbon monoxide poisoning from gasoline engines. Suicides in cars from gasoline engine exhaust are common also and are well documented in public health reports. The most common deaths from carbon monoxide occur, however, when people simply park their vehicles and run their car or truck engines to keep warm in winter - or cool in summer - by means of an automotive air conditioner. Approximately one thousand accidental deaths still occur in this way every year in the US alone, even though American cars are routinely equipped today with catalytic converters and emission controls. But there are no known deaths in cars or trucks with Diesel engines! Every night across the world, tens of thousands of truck drivers sleep in their truck cabs with the Diesel engines running throughout the night - to keep warm in winter or cool in summer. Although there are always some exhaust leaks into the van compartment of a truck, there is no evidence of even one trucker dying, or being injured, in such circumstances. It never happens. There are no known Diesel suicides either. Diesel exhaust is inherently safe. A major engineering textbook from 1998, which should contain just about everything one needs to know about Diesel emissions. is entitled: Handbook of Air Pollution from Internal Combustion Engines with the subtitle Pollutant Formation and Control. The book is co-authored by a dozen of the world's leading experts on automotive emissions. It should be an excellent source of information on precisely how one might kill people with Diesel exhaust. But in the entire 550 page book, which is rather typical of all other books one can find on this subject, there was only one sentence relevant to our subject. "Although carbon monoxide (CO) emissions are regulated, they will not be considered here, as the Diesel engine combustion process by definition inhibits the production of CO."
In other words, the toxic effects from carbon monoxide in Diesel exhaust, including long-term effects, were just not worth bothering with as a pollutant of any kind. What is ironic is that the editor is an Israeli professor of engineering in the Department of Mechanical Engineering at Ben-Gurion University. His name is Eran Sher. Someone should reach out to him and ask if he believes the National Socialists murdered people with Diesel exhaust and whether he had ever considered testifying as an expert in the trial of John Demjanjuk. On whose side would he have testified? Surely, if Eran Sher and the Israelis really believe it happened in National Socialist Germany, then it might happen again. Surely, we should be concerned that Arab leaders may use their tens of thousands of Diesel trucks to perpetrate another 'Holocaust.' Surely, the United Nations arms inspectors who are searching for weapons of mass destruction in the Middle East will miss the boat if they fail to investigate Arab Diesels. To impose a substantial load on any engine is far from easy. For example, if one has an ordinary truck, a full load can be imposed on the engine by first filling the truck with a heavy cargo and then racing the vehicle up a steep hill with the fuel pedal to the floor. Under that condition, one would probably be putting out about 0.4%/vol. CO, which is indeed lethal, from the exhaust pipe of an undivided chamber Diesel. However, if the truck is simply parked in a driveway, it is practically impossible to impose any significant load on the engine. Merely 'racing' the engine with the transmission in neutral will impose no more than a few percent of load. Letting the clutch slip and stepping on the accelerator may impose a somewhat greater load on the engine - but the clutch will rapidly burn out. Jacking up the rear end of the vehicle and applying the brakes while racing the engine will impose a somewhat greater load, but the brake linings will rapidly burn out. The only way to realistically impose a significant load on any engine is by coupling to the engine some kind of brake dynamometer or other load, such as a generator with an electrical load, a fan, pump, or the like. Brake dynamometers were available, but, although the Germans must have had many in engineering testing laboratories, they are not readily available. They are not the kind of equipment that one finds in auto repair shops even today. They cost far more than the engines to which they are attached, since they are not mass-produced - at least not at that time. An electric generator arrangement seems possible, since Treblinka and Belzec would have needed electricity, even if only to keep the barbed wire charged and the lights burning, and also because in those days the rural areas of these camps in eastern Poland may not have been connected to a public power grid. However, such an arrangement suggests a continuous operation of both the generator and the Diesel engine, which is contrary to the Gerstein Statement. According to that statement, the engine had to be started just for the gassing. There is nothing in the statement to even remotely suggest that the engine served any other purpose than to kill Jews. If it had had a dual purpose, for example to also drive an electric generator, one would expect some comment about the lights going on as the gassings began, but there is nothing of the sort. In fact, according to the Gerstein statement, Pfannenstiel had "his eyes glued to the window in the wooden door" before the Diesel even started which strongly suggests that the "electric light which illuminated the interior of the room" must have been on before any gassing even started. In other words, there must have been electricity from a power source other than the alleged Diesel gassing engine. Postwar 'eyewitnesses' for Treblinka related trials actually claimed that the same building where the 'gassing Diesel' was housed also contained a second engine which operated independently of the first and which supplied electrical power to the camp. In other words, these accounts specifically show this generator not to be related to those engines that allegedly produced poison gas, just as accounts of the poison gas engines never suggest any other, continuous use of those engines. On the contrary: accounts describing events as the engine was supposedly being started are amazingly similar. The command given to the engine operator to start the engine - "Ivan, water!" (Treblinka) - or similar events for Belzec ("Heckenholt Foundation") appear not just in the Gerstein Statement, but run like a central theme throughout of the eyewitness literature. From documents of the Central Construction Office of Auschwitz (Zentralbauleitung), we know that the SS provided this camp with emergency power equipment consisting of German Diesel engines rated at 440 hp and electric generators rated at 250 kW. Witnesses stated explicitly that the power facilities were constantly running under some load in Treblinka due to the lack of a connection to a public network and that these engines operated in addition to the gassing engines which operated only sporadically. Something is obviously wrong with these 'eyewitness' stories. Anyone with any expertise would have used the exhaust of the engine driving the generator which was already operating under load, instead of an additional engine for gassing purposes without any load. Besides, the exhaust from the engine driving the generator was already there and available (where else would the exhaust go except into the sky). To start an extra Diesel with or without some specially-arranged load is ridiculous. Arguably, the analysis of CO and reduced oxygen has until now been highly theoretical - and yet, it has still not included possible combinations of effects with all other ingredients in Diesel exhaust. A theoretical analysis of all such combinations of effects is beyond analysis. Happily, there is a detailed study of the actual effects of full strength Diesel exhaust on living animals. It appeared in the British Journal of industrial Medicine in 1957. To my knowledge, this is the only study of this type ever undertaken and is the most important single piece of evidence for the analysis of Diesel toxicity anywhere. Eight experiments were performed with undiluted exhaust from a small Diesel engine under four different operating conditions - two essentially identical experiments for each operating condition. Each experiment was performed on four rabbits, ten guinea-pigs, and forty mice. The animals were only introduced into the chamber after the Diesel exhaust concentrations had had approximately half-an-hour to stabilize and purge the chamber of all other air. All rabbits survived the five hour exposure and even continued to live for a week thereafter. Of the guinea-pigs, only one died during the actual five-hour exposure period, although most died over the next seven days. Of the mice, only a minority died during the five hour exposure and most even survived through the following week. Under Condition D, which was by far the most extreme test with a severely restricted air intake, a maximum CO level of 0.22%/vol. was produced with an oxygen concentration of 11.4%/vol. Although many, but not all, of the mice died within an hour, all of the rabbits and guinea-pigs survived for more than one hour of continuous exposure. For exposures only as long as Gerstein alleged (32 minutes), the survival rates would have certainly been even better. In other words, on the basis of tests on living animals with full-strength Diesel exhaust, Gerstein's gas chamber would have been a complete fiasco. When the exhaust from a Diesel engine enters a gas chamber, the carbon monoxide concentration will initially be extremely low and the oxygen level will be high. As more and more Diesel exhaust fills the gas chamber, the carbon monoxide concentration will gradually rise to the same level as one finds directly inside the exhaust pipe of the Diesel engine - without ever exceeding that level. It is impossible to determine from the Gerstein Statement how long it would have taken before the CO concentration in the gas chamber equaled that in the exhaust because Gerstein does not provide nearly enough information about the engine or alleged gas chamber in Belzec. For Treblinka, the 'eyewitness' statements are somewhat more detailed, but still contradictory. It is generally alleged that the larger and more important of the two gas chamber buildings in Treblinka consisted of 10 chambers, five on each side of a corridor. Each chamber measured 8 m in length, 4 m in width, and 2 m in height, totaling 320 m2 in area and a 640 m3 in volume. The chambers were allegedly filled with the exhaust from only one Russian Diesel tank engine, which could have only been the 550 hp V12 with a displacement of 38.86 liters. The total area of 320 m2 could not have held more than 3,200 persons at one time. Given an average body volume of 75 l, these people would have taken up a space of 240 m,3 leaving about 400 m3 air volume. The Russian Diesel tank engines of those days had a maximum speed of 2,000 rpm. Since a four-stroke engine discharges the contents of its cylinders only every second revolution, an engine running at 2,000 rpm blows an exhaust volume of one thousand times its cubic capacity into the chamber per minute, i.e., 38.86 m.3 Therefore, after a little more than ten minutes, enough exhaust would have been discharged to replace the entire air volume of the gas chambers only once. The eyewitnesses claim that the gas chambers were sealed hermetically; in other words, they were air-tight. But this is impossible, since there must have been some openings for the excess gas to escape. Also, without many holes and cracks, everyone would have already died during the "2 hours and 49 minutes" by Gerstein's stopwatch. However, since some of the Diesel exhaust would have also escaped through holes or cracks - not just normal air from within the chamber - and since the intended victims would have also consumed some of the carbon monoxide, a minimum of two complete air exchanges of the room volume seem entirely reasonable for filling the chamber entirely with the exhaust. At 2,000 rpm, therefore, one cannot expect the CO content to have reached the level of the exhaust itself in less than 20 minutes from the start of the gassing procedure. If a restricted air intake to the engine had produced a 0.22%/vol. CO content in the exhaust in the worst case possible, the average CO concentration would have then approximated 0.11%. The full 0.22%/vol. CO would have been available for no more than the last twelve minutes of the gassing, which took 32 minutes at most. The 20 minutes with a CO level of 0.11%/vol. and the additional 12 minutes at 0.22%/vol. CO result in an effective average for thirty-two minutes of only 0.15%CO/vol. (simply on the basis of mathematical averaging). At an oxygen content of ca. 11.4%/vol., this amounts to an effective CO content of 0.28%/vol., which is not enough to kill all humans within half an hour. In other words, it is well below the 0.4%/vol. of CO that we had identified in Section 5 of this article as the minimum needed. In the animal experiment previously described with a real CO concentration of 0.22%/vol., which was already established before the test animals were even introduced and which, because of the reduced oxygen content of 11.4%/vol., corresponded to an effective CO concentration of (0.22�21�11.4=) 0.4%/vol., it still took more than three hours to kill all of the test animals. It is, therefore, perfectly reasonable and even quite conservative to say that in a similar gassing attempt with humans and with only a gradually increasing CO concentration, the majority of people in the alleged gas chamber would still be alive after one or even two hours. Such a result would have been an utter fiasco. Carbon monoxide gas is an excellent fuel and actually burns far more easily than Diesel fuel or even gasoline. As the exhaust gas recirculates, any additive increase in carbon monoxide levels which one might at first expect will, in fact, not occur at all so long as there is still sufficient oxygen to allow the CO to burn in the cylinders. If the CO level is initially only 0.05% after the first pass through the engine, one might - wrongly - expect it to double to 0.10% after the second pass, and then rise to 0.15% after the third pass, and so on, and on. In reality, however, the carbon monoxide concentration is not at all accumulative so long as the air to fuel ratio remains above 15:1. Since the initial fuel/air ratio is probably more than 100:1, there will be no significant change in CO concentration until several complete exchanges of gas have occurred and just shortly before the engine shuts down. This is confirmed by results in a US Bureau of Mines study which also shows that the CO levels remain low until just shortly before the engine shuts down. Whether the engine dies before the intended victims die is the important question. In order to obtain 0.22%/vol. of CO in the experiment conducted by Pattle et al., the engine's air intake had to be so severely restricted that it did misfire during warm-up. This means that choking the engine even more by reducing the oxygen concentration from 21%/vol. of normal air down to 11.4%/vol. of recirculated exhaust gases would have shut down the engine most likely well before all victims had died. There is no mention in the Gerstein statement or anywhere else of the engine shutting down. The only reference to engine problems is that Mr. Heckenholt allegedly needed more than two hours just to get the engine started, during which time the survival of the victims would have required many air leaks into the gas chamber. It seems about as reasonable as anything else to conclude from the Gerstein statement that the engine ran throughout the 32-minute gassing period without any problem from lack of oxygen, or for any other reason. In other words, even the recirculation argument fails to fit any of the Diesel gas chamber scenarios from Gerstein, or anyone else. Without a thorough understanding of the basic characteristics of Diesel engines, the simple-minded method that would have come to mind most readily would have been to simply park a Diesel truck or a T-34 tank outside the gas chamber building and pipe the exhaust into the gas chamber without any load on the engine. Such an arrangement would have annoyed the hell out of any group of intended victims, but would have given them nothing worse than a headache. The headache would have been due to the stench, and smoke, and noise, but certainly not to carbon monoxide and/or lack of oxygen. As a method for mass murder, it would have been a fiasco. For any Diesel arrangement to have been even marginally effective for mass murder, it would have required an exceptionally well-informed team of individuals to know and do all that was necessary. They would have had to be familiar with the carbon monoxide and oxygen emission curves for their particular engine. Such information is probably not known even today by most engineers. The Diesel gas chamber designers would also have had to know either 1) how to impose and maintain an engine load of more than 3/4 of full load on their engine, since anything less would just not have been enough, or 2) how to combine a restricted air intake with some lesser degree of engine loading to achieve the same effect. If they had overloaded the engine or had operated it for too long at or near full load (more than 80% of full load is generally considered unsafe for continuous operation), they might after each gassing have had to overhaul and perhaps replace the engine because of fouling and damage from engine smoke. Merely to gather and assemble the appropriate equipment, including the equipment for imposing and controlling an artificial load, would have been a major undertaking which would have required the expertise of experienced engineers, not just ordinary auto mechanics. If the engine (550 hp!) had been mounted on the floor of the building, it would have required a proper foundation with some provision to isolate vibrations so as to avoid tearing the building apart. The all-important question is: if any persons had been smart enough and resourceful enough to know and do all that was necessary to make a workable Diesel gas chamber, why would they have bothered with a Diesel engine in the first place? For all their efforts, they would have had an average effective concentration of less than 0.4%/vol. carbon monoxide and more than 4%/vol. oxygen, resulting in execution times of probably more than two hours. Any common, ordinary gasoline engine without any special attachments would easily have given them ten times more carbon monoxide at idle as any comparably-sized Diesel at full load.. Any common, ordinary gasoline engine would easily have given them 7%/vol. carbon monoxide and less than 1%/vol. oxygen. If one had fiddled with the carburetor, one could have had as much as 12%/vol. carbon monoxide by merely turning one small screw, namely the idle-mixture adjustment screw. Comparing the two types of engines with both operating at idle or under light load, the difference is even more dramatic. At idle or under light load, any common, ordinary gasoline engine without any special attachments would easily have given more than one hundred times as much carbon monoxide as any comparably sized Diesel. The hoax becomes even more obvious when one discovers that far better sources of carbon monoxide, better even than gasoline engines, were readily available to the Germans - and required neither Diesel fuel nor gasoline. 9. Half a Million Poison Gas Generators on Wheels - Never Used for Mass Murder! During World War Two, most European countries relied for most of their non-military automotive transport upon vehicles which used neither gasoline nor Diesel, but burned solid fuels such as wood, coke, or coal instead. The solid fuel, which was generally wood, was first converted into a mixture of combustible gases by burning in a generator, usually mounted at the rear of the vehicle. The gases were then withdrawn from the generator by engine suction through a pipe beneath the vehicle, and then burned in a modified gasoline or Diesel engine located at the front of the vehicle. The combustible gas produced in this way always contained between 18%/vol. and 35%/vol. carbon monoxide. The exhaust of engines operated with this producer gas never contained more than 0.3%/vol. CO, since nearly all of the CO was consumed in the engine. Illustration 1: A typical gaswagon which had originally been a conventional bus but which was subsequently retro-fitted with a gas-generator and a Saurer engine. In German-speaking parts of Europe, these vehicles were called Generatorgaswagen, or simply Gaswagen. If they burned wood, which most of them did, they were also called Holzgaswagen which translates literally as "woodgaswagons." In English-speaking countries, these vehicles were generally called "producer gas vehicles." However, they could just as appropriately have been called "poison gas vehicles" because that is precisely what they were. The operation of these vehicles required special safety procedures as well as special government-approved training and licensing of the many hundreds of thousands of drivers who drove these vehicles daily throughout German-occupied Europe. The gas from the gas generator contains up to 35% carbon monoxide (CO). Carbon monoxide can be fatal at concentrations as low as 0.1% when inhaled. For this reason - especially while starting the fire or during refilling - there is a danger of poisoning! Start and refill the gas generator only out-of-doors! Do not linger unnecessarily near the blower discharge. Do not let engines run in garages. Illustration: 2: Saurer BT 4500 with producer gas generator. 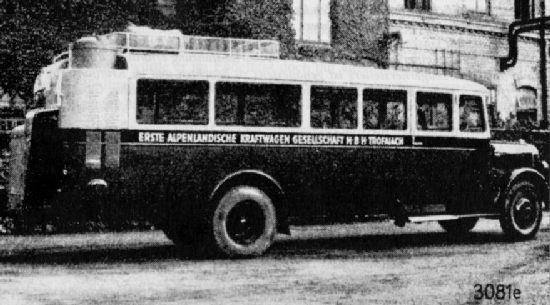 A Saurer truck similar to this type allegedly was used for mass murder in Kulmhof/Chelmno - not with producer gas, but incredibly with its exhaust gas. Illustration 3: Austro-Fiat 4 D 90 A, producer gas generator as standard fitting. Already the first two sentences of these "safety guidelines" tell every driver the two most important facts they should know if they wish to commit mass murder. Producer gas is poison gas! All producer gas vehicles were, in effect, self-propelled gas generators. The fuel itself was poison gas. "Vehicles of this kind will retain their special significance after the war as well; for given the trend towards increasing motorization, we will never have a surplus of liquid fuel and will always be dependent on imports. The additional domestic fuels thus benefit our own national economy." By the autumn of 1941, some 150,000 producer gas vehicles were already in use in Germany and the areas controlled by her. The conversion of existing trucks to producer gas resulted in a monthly savings of about 45 million liters of liquid fuel. The goal was "to free every bit of dispensable fuel for the Wehrmacht." By the end of the war, more than 500,000 producer gas vehicles had been put into service by the Germans. "to boost generator production, to determine new types on the basis of the fuel situation at hand, to develop new solid fuels for use in the generator, and to develop suitable processes for preparation and low-temperature carbonization etc." "I refer to the explanations in my aforementioned decree, regarding the urgency of making Germany as well as the occupied territories and dependent lands largely independent of liquid fuel as quickly as possible, and would ask you to vigorously support the efforts of the Central Office through the increased use of generators." As the war continued, conversion to solid fuel became more and more urgent. On September 22, 1942, Reich Minister Speer, acting in his capacity as plenipotentiary for armament production (GBRüst), ordered the conversion of all medium and heavy vehicles including buses in all German-occupied regions. A year later, the GBRüst's amendment of September 13, 1943, eliminated all exemptions. Now the conversion of all civilian vehicles was mandatory as well, including even the smallest automobiles. After the war, in a long report about German oil production, the U.S. Strategic Bombing Survey stated that even some of the best German tanks, 50 Königstiger, had been driven with producer gas just before the war's end. Illustration 5: The Imbert-Generator was the most widespread producer gas generator of the Third Reich, here in mass production on an assembly line in Cologne 1943. The vast numbers of producer gas vehicles as well as the fervor with which the Germans developed new vehicles and uses for this gas technology, which is so evident throughout their wartime automotive literature, undermine the Holocaust story in general. If the Germans had ever intended to commit mass murder with carbon monoxide, they certainly would have had enough brains to employ this superb poison gas technology long before using anything as idiotic as Diesel exhaust. And, it would have worked! Eichmann and the other 'transportation experts' involved in the "final solution of the Jewish question," which was indeed primarily a transportation problem, would certainly have been fully aware of these vehicles. If they had had any expertise at all, they would have also been aware of some of the unique features of these vehicles as well. For example, each generator had a startup blower which was powered by either a small electric motor or by hand. It would have been childishly easy to attach a hose, or pipe, to the exhaust of that blower so as to force poison gas into any cellar, barracks, or prison, but nowhere in the vast Holocaust literature is any such technology even suggested. Another irony is the fact that the same producer gas technology was actually used to gas rats and other vermin. According to the public health literature from the Third Reich, producer gas equipment from the firm of Nocht-Giemsa for killing rats was "very common." And yet, no one thought of using this obvious, practical, effective, simple, and cheap technology on humans - even Jews who had sometimes been compared to rats as in the film "Der Ewige Jude" (The Eternal Jew). Obviously, the National Socialists were not nearly as fiendishly clever, as exterminationists often claimed they were, in connecting Jews to rats. 10. Vans with Diesels for Mass Murder? The producer gas vehicles are not the same as the "gas vans" allegedly used for mass murder in Chelmno and by the Einsatzgruppen in Russia, despite the ironic circumstance that the words used in German for both kinds of vehicles are similar. According to all the 'evidence,' the murderous "gas vans" were ordinary heavy vehicles whose exhaust (most often from a Diesel operating at idle) became the lethal gas. The gas van story is based primarily on a strange Nuremberg trial document known as PS-501, which is a probable fabrication based upon an unavailable, innocuous letter from SS-Untersturmführer Becker to SS-Obersturmbannführer Walther Rauff, in which Bekker requested all-wheel-drive vehicles so that he could more easily travel the muddy Russian roads. The letter suggests modifications to an S-vehicle. The text of an unavailable original seems to have been rewritten with several changes to give it an incriminating significance. There are several different versions of this 'document' which has been critically assessed in the present volume by Ingrid Weckert. The Diesel murder claims probably originated in mid-1943 Soviet propaganda. A short time earlier, in April 1943, the German discovery of the massacre of thousands of Polish officers at Katyn had exposed the Soviets as ruthless mass murderers. The Germans had openly invited internationally-renowned forensic scientists, even from enemy countries, to thoroughly examine the victims. To avenge themselves on the Germans for the debacle of Katyn, the Soviets staged show trials a few months later in Char'kov and Krasnodar. In the course of those trials, some unfortunate German prisoners provided 'confessions.' However, the Soviets denied any and all non-Soviet experts access to the alleged sites of the massacres. The Soviets accused the Germans of having driven civilians into the countryside in Diesel trucks. After the trucks containing the victims were parked, the Diesel engine exhaust was allegedly redirected into the interior, and the victims expired shortly thereafter. In this scenario, the Diesel engines would have been operating without any load and at fast idle at the very worst. The CO concentrations under such conditions would hardly have caused a headache in half an hour. Some of these trucks were said to have been manufactured by the firm of Saurer. The ironic part of this tale is that even before the war, Saurer was arguably the manufacturer of the world's best and most efficient producer gas trucks. During the war, this Swiss-Austrian firm continued its technical leadership over Mercedes, Opel, and Ford who were actually manufacturing far more producer gas vehicles. More than 6,000 Saurer trucks were built in Vienna during the war and most, if not all, had producer gas generators and Diesel engines. How absurd to believe anyone with even a minimum of technical understanding would even try to use the exhaust from these trucks for murder, when the fuel itself was a thousand times more lethal! A television series produced during the collapse of the Soviet Union and aired in the United States in 1993, provided further insight into the Soviet origins of the gas van tale. The four-part broadcast was entitled: "Monster: A Portrait of Stalin in Blood." At one point in the second part, subtitled "Stalin's Secret Police," KGB officer Alexander Michailov claimed that the gas trucks were invented in Moscow by Isai Davidovich Berg - no relation to this author - and were already in use a few years before the war. According to Michailov, these may have served as a model for Hitler's SS and the Gestapo. Diesel engines were not mentioned. This is explained by the fact that all pre-war trucks in the Soviet Union had only gasoline engines. There were no Diesel engines since the entire transportation system in the USSR was based on earlier, western engine types such as that of Ford Motor Co. More than likely, the Soviet allegations of gas trucks are truly based on the Soviets' own mass murder technology to which they simply added Diesel engines to make them seem more sinister and, most of all, more German. The gas van story is an adaptation of some documentary materials relating to the perfectly innocent use of producer gas vehicles - supported, of course, by appropriate 'eyewitness' testimony. It is within the gas van story, however, that one can see in miniature the process by which the Holocaust story in general has been confabulated. "In the autumn of 1942, the Germans began to use specially equipped automobiles which the population called 'murder vans,' for the purpose of doing away with Soviet citizens. These 'murder vans' were covered five-ton or seven-ton gray-painted motor trucks, driven by Diesel engines." "The vans are lined inside with galvanized iron and have airtight folding doors at the back. The floor is equipped with a wooden grating under which passes a pipe with apertures. The pipe is connected to the exhaust pipe of the engine. The exhaust gases of the Diesel engine, containing highly concentrated carbon monoxide, enter the body of the van, causing rapid poisoning and asphyxiation of the people locked up in the van." The simple fact is that Diesel exhaust never contains "highly concentrated carbon monoxide." In a later publication entitled "Soviet War Documents" from December 1943 and published by the Soviet Embassy in Washington, DC, we have a description of the gas van on page 172. According to that description, the engine was a "Sauer" engine. There is no "Sauer" engine manufacturer but there is the famous company called "Saurer" which was discussed earlier. The connection that is made here to a company called "Sauer" is significant because .it reappears in the infamous fake letter from Becker to Rauff in Nuremberg File PS-501.. By their common errors one can recognize the work of the forgers. There is never any mention anywhere of the engines having been gasoline engines - although that would have certainly made sense technically - nor is there any mention of producer gas wagons which would have made all the sense in the world. The least important of the six supposed extermination camps, in terms of numbers of victims, is Chelmno. Oddly enough, it is the Chelmno story that seems to have some persistence even among Holocaust skeptics. The 'evidence' is especially vague and consists essentially of anecdotes, many describing events long after September 13, 1943, when all use of liquid fuels (gasoline or Diesel fuel) for non-military vehicles was strictly prohibited and when producer gas was required as the only alternate fuel. The anecdotes invariably allege that the driver, just prior to departure with a batch of entrapped victims, would work on something or other (always totally undefined as to what and how) beneath the vehicle to redirect the exhaust from the engine (Diesel or gasoline - take your pick) into the van compartment to kill the victims. For producer gas vehicles, a lengthy startup procedure (half-an-hour seems to have been common) involving many adjustments to the gas generator and piping below the vehicle was, indeed, always necessary, but this was not the case for vehicles using liquid fuels. More than likely, some 'witnesses' had actually seen a producer gas startup procedure and then, after the war, embellished that true experience to make something atrocious. But what argues most strongly against all such stories is that the use of trucks (medium and heavy) using any kind of liquid fuel had already been prohibited a year earlier by Speer on September 22, 1942; smaller vehicles were still exempt until a year later (see section 9). To break the law for a few per cent of CO from gasoline engine exhaust - or even only a fraction of a percent from Diesel engine exhaust - when the legally required fuel was far more lethal, is too ridiculous. It never happened!. Producer gas is poison gas - extremely poisonous with CO concentrations as high as 35%. Although there is no credible evidence of any deliberate gassings with producer gas vans, there were no doubt many fatal, accidental gassings. These arose almost inevitably from the nature of the half million producer gas vans which made their own CO. Fatal accidents were inevitable from the earliest uses of these vehicles and, no doubt, became more frequent as the war made it more difficult to properly train drivers. However, this author has found no actual record of any such accidents in the German wartime literature. The severe dangers of accidental poisonings and explosions are, however, clearly spelled out in the German literature including the safety guidelines. It is in the post-war literature of Scandinavia that one can, however, find the most startling detailed information as to the many medical problems arising from producer vehicles. Poisonings from producer gas were so common in Sweden, for example, that two special clinics were established to treat the victims. When the war ended, the use of these vehicles declined only gradually. In the early 1950's in West Germany, at least 20,000 were still in use, and their safe operation was still of great concern to medical professionals. "War-time Germany was an empire built on coal, air and water. 84.5% of her aviation fuel, 85% of her motor fuel, more than 99% of all her rubber, 100% of her concentrated nitric acid - the base substance for all military explosives - and 99% of her no less important methanol were synthesized from these three raw materials. [...] Coal gasification facilities, where coal was converted into producer gas, were the body of this industrial organism." Because of Germany's isolation from adequate sources of petroleum and natural rubber, she had already converted much of her industry during World War One to use coal as a substitute source of hydrocarbons for making synthetic liquid fuels as well as a vast assortment of chemical substances, including synthetic rubber. Millions of tons of carbon monoxide were produced as part of this technology and would have been more than enough to kill the entire population of Europe many times over. Coal gasification plants were located in all of Germany's industrial regions. One region containing several such plants was Silesia, where the abundance of coal had for more than a century been the basis of that region's industry. One Silesian facility was the IG Farbenindustrie A.G. plant at Auschwitz, a small portion of whose carbon monoxide could easily have been diverted through a small pipeline to Auschwitz-Birkenau only a few miles away. But no one alleges that carbon monoxide was ever used for mass murder at Auschwitz, although that would have been an ideal place for it. For mass murder at Auschwitz, the Germans supposedly used a completely different substance: Zyklon B. A marvelous attempt at evasion and distortion took place nearly twenty years ago in the Holocaust story. A group of twenty-four of the world's leading Holocaust 'scholars' tried to drop the Diesel claim by not even mentioning the engine type and by referring only to gasoline engines. This amazing metamorphosis took place in Nationalsozialistische Massentötungen durch Giftgas, published in Germany in 1983. This extremely pretentious book represents the state of Holocaust mythomania in the first half of the 1980s and was recommended by the World Jewish Congress in London. For example, the next to last chapter entitled "The two Poison Gases" (Die Zwei Giftgase) even gives the molecular weight of CO, twice, as well as many other totally irrelevant technical properties of CO and HCN. Many readers were no doubt impressed. The clumsy juggling of evidence, which characterizes this book, is shown by the fact that although the Gerstein Statement refers to Diesel engines four times, the portion quoted in this supposedly definitive rebuttal of the Revisionists does not mention the Diesels at all, nor does it even describe the alleged killing process. For such a description, the book gives instead a piece of post-war testimony by Dr. Pfannenstiel, in which there is also no mention of the use of Diesels, but only of the use of "Diesel fuel" in the engine. How one could possibly have operated a gasoline engine with Diesel fuel was, of course, left to the reader's imagination. The fact is that any gasoline engine simply would not operate with Diesel fuel - and vice versa. A fatal flaw in the non-Diesel version of the CO murder story is the recurrent claim that the corpses were "blue." Death from gasoline engine exhaust would 'only' have been due to carbon monoxide and could 'only' have caused a distinctive cherry red or pink appearance. Although Pfannenstiel's post-war testimony is not nearly as wild as the Gerstein Statement, nonetheless, he and other so-called eyewitnesses also repeated the claim that the corpses were "blue." That the Gerstein Statement, even in a severely and fraudulently abbreviated form, was included in Massentötungen at all only shows how desperate the Holocaust scholars are to scrape together anything and everything in support of their monstrous fantasy. The new 'revised' version of the Holocaust story is even more absurd than the old version. Although an engineer might mistake a gasoline engine for a Diesel engine, how could anyone mistake red for blue? Perhaps they were all color-blind? The Diesel gas chamber claim is rubbish - apparently some of the exterminationists including Raul Hilberg recognize that now. However, the alternate claim that gasoline engine exhaust was used instead is rubbish also, since it contradicts the only evidence that is available, namely the contradictory statements of the witnesses. For this reason, the Holocaust pundits have recently returned to the old story: the 1993 Enzyklopädie des Holocaust agrees with the Jerusalem verdict about Demjanjuk's alleged crimes in Treblinka as well as with the findings of German courts: They were Diesel engines! Although it would have been theoretically possible to commit the deeds alleged for Treblinka, Belzec, and Sobibor with Diesel engines, it would have required an inordinate amount of expertise and determination as well as technical apparatus to impose or simulate sufficient load on the Diesel engines. Such expertise is not even remotely indicated by the eyewitness testimony or by any other evidence. Even if all the necessary conditions had been met, the would-be murderers would ultimately have had an arrangement which at best (worst?) would still have been only marginally effective at its morbid task. It would be hard to imagine a mass murder method more awkward and more inefficient. Even if some deranged minds had tried for a time to commit murder with Diesel exhaust, after a few tries it would have become apparent to even the most demented fiend that something far better was needed. The idea that the National Socialists actually used such a method not just for a few fiendish experiments, but continually over many months in several different locations is too preposterous. It never happened! If the National Socialists had ever intended to commit mass murder with CO, they would doubtless have used the ubiquitous producer gas technology. 500,000 producer gas vehicles are the incontrovertible evidence that the Diesel claim is totally absurd. "The Nazis did not manufacture soap from human fat, and did not kill their victims with Diesel exhaust. All these rumors were circulated in 1942, but we have the duty to thoroughly separate these rumors and fabrications from the facts and truth. Little lies provide fodder for the deniers and act against us." The absence of credible evidence will continue to drive revisionism long after the current crop of revisionists has gone. Ultimately, the purveyors of the National Socialist homicidal gassing claims condemn themselves. The German officials who suppress, even with imprisonment, the least expression of doubt about the gassing claims condemn themselves as well. This chapter is an expanded and revised edition of F. P. Berg's article "The Diesel Gas Chambers - Myth Within a Myth", The Journal of Historical Review (JHR) 5(1) (1984), pp. 15-46 (online: ihr.org/jhr/v05/v05p-15_Berg.html). Although this author gladly takes credit for this work, the editor Germar Rudolf deserves credit also for having made many substantive additions to the arguments and for many important reference citations. The history of, and public reactions to, this travesty of justice are described in the following chapter by A. Neumaier. New York Post, March 17, 1990; The Washington Times, March 19, 1990; repeated on "This Week with David Brinkley", ABC television, Sunday, Dec. 8, 1991. Cf. the chapter by W. Rademacher, this volume, as well as afp, "Österreicher bestreitet Holocaust", Süddeutsche Zeitung, March 13, 1992, p. 10; Neue Kronenzeitung, April 20, 1993; "Ein rauhes Lüftl", Bau 5/1995, p. 8; "Rechte Gutachten", Profil, June 20, 1994; E. Kosmath, letter to the editor, Bau 11/1994; ARA, "Lüftl wieder in Kammer, 'Schwieriges Problem'", Standard (Vienna), Sept. 19, 1994. W. Lüftl, "Sollen Lügen künftig Pflicht sein? ", Deutschland in Geschichte und Gegenwart, 41(1) (1993), pp. 13f. (online: vho.org/D/DGG/Lueftl41_1.html). J. Bailer, in Brigitte Bailer-Galanda, Wolfgang Benz, Wolfgang Neugebauer (eds. ), Wahrheit und Auschwitzlüge, Deuticke, Vienna 1995, pp. 99-118, here 100-107; cf. G. Rudolf, "Zur Kritik an 'Wahrheit und Auschwitzlüge'", in Vrij Historisch Onderzoek (ed. ), Kardinalfragen zur Zeitgeschichte, Vrij Historisch Onderzoek, Berchem 1996, pp. 91-108, here 98-102 (online: vho.org/D/Kardinal/Wahrheit.html; English: vho.org/GB/Books/cq/critique.html). Cf. the articles by G. Rudolf, Carlo Mattogno, and Jürgen Graf in this volume. R. Hilberg, The Destruction of the European Jews, Quadrangle Books, Chicago 1961, p. 572; German ed. : Die Vernichtung der europäischen Juden, Olle & Wolter, Berlin 1982, p. 604. Updated with information from the official German Institut für Zeitgeschichte (Institute for contemporary History). Maximum figure given by F. Golczewski in W. Benz, Dimension des Völkermords, Oldenbourg, Munich 1991, p. 495. From 9 million to 500,000, depending on the source. At the moment, 1 million is the officially espoused figure; cf. the chapter on statistics by G. Rudolf, this volume. R. Hilberg, op. cit. (note 8), Eng. ed. p. 562. William B. Lindsey, "Zyklon B, Auschwitz, and the Trial of Dr. Bruno Tesch", JHR 4(3) (1983), pp. 261-303 (online: vho.org/GB/Journals/JHR/4/3/Lindsey261-303.html). H. Roques, Faut-il fusiller Henri Roques?, Ogmios Diffusion, Paris 1986 (cf. online: www.vho.org/aaargh/fran/ACHR/ACHR.html); cf. also André Chelain, La Thèse de Nantes et l'affaire Roques, Ogmios Diffusion, Paris 1989 ; abbrev. German ed. : H. Roques, Die "Geständnisse" des Kurt Gerstein, Druffel, Leoni 1986 (online: www.vho.org/aaargh/deut/HRgerstein1.html); cf. D. Felderer, JHR 1(1) (1980), pp. 69-80; D. Felderer, JHR 1(2) (1980), pp. 169-172 (online: vho.org/GB/Journals/1/1/Felderer69-80.html & .../2/Felderer169-172.html); C. Mattogno, Il rapporto Gerstein - Anatomia di un falso, Sentinella d'Italia, Monfalcone 1985; cf. Raul Hilberg, "Expert's admission: Some gas death 'facts' nonsense", Toronto Sun, Jan. 17, 1985. An example of gross distortions is L. Poliakov, Harvest of Hate, Schocken Books (Holocaust Library), New York 1979, p. 195 (French ed. : Bréviaire de la Haine, Calman-Levy, Paris 1951, pp. 220ff.). R. Hilberg, The Destruction of the European Jews, Holmes and Meier, New York 1985, pp. 890, 892, 963, 964, 975f. According to Y. Arad, Belzec, Sobibor, Treblinka: The Operation Reinhard Death Camps, University Press, Bloomington 1987, p. 123, the real name of this Heckenholt was Lorenz Hackenholt. Besides Hackenholt, Arad claims that Ivan Demjanjuk was responsible for operating the Diesel gas chambers in Treblinka, ibid., p. 86. In light of the disastrous outcome of the Demjanjuk affair for the Israelis, it should now be obvious that most of the eyewitness accounts used by Arad are worthless. It appears that Arad's book, published when the Demjanjuk case was not yet settled, is nothing more than propaganda for influencing the trial's outcome. This sentence is missing from the version given by H. Rothfels (ed. ), "Augenzeugenberichte zu den Massenvergasungen," Vierteljahrshefte für Zeitgeschichte 1 (1953), pp. 177-194. Instead, Rothfels remarked: "A strictly personal observation then follows." Version T2, H. Roques, op. cit. (note 14), German ed., p. 57. Even closely crowded, 10 people per square meter are the maximum; cf. E. Neufert, Bauentwurfslehre, Vieweg, Wiesbaden 1992, p. 27; cf. U. Walendy, Historische Tatsachen no. 29, Verlag für Volkstum und Zeitgeschichtsforschung, Vlotho 1985, p. 12: 46 persons will fit onto the 4.44 m2 load area of a heavy-goods vehicle, according to Quick, April 25, 1985. Letter from Pfannenstiel to P. Rassinier, dated Aug. 3, 1963, published in W. Stäglich, U. Walendy, "NS-Bewältigung", Historische Tatsachen no. 5, Historical Review Press, Southam (GB) 1979, p. 20. Regarding the toxicology of carbon monoxide, cf. e.g. : W. Forth, D. Henschler, W. Rummel, K. Starke, Allgemeine und spezielle Pharmakologie und Toxikologie, 6th ed., Wissenschaftsverlag, Mannheim 1992, pp. 756ff. ; S. Kaye, Handbook of Emergency Toxicology, C. C. Thomas, Springfield 1980, pp. 187f. ; C. J. Polson, R. N. Tattersall, Clinical Toxicology, Lippincott, Philadelphia 1969, pp. 604-621. L. Poliakov, Harvest of Hate, op. cit. (note 15), p. 196. Further typical and fundamental sources that speak of the use of Diesel engines include: W. Grossmann, Die Hölle von Treblinka, Foreign Languages Publishing House, Moscow 1947: death occurred within 10-20 minutes due to tank engine exhaust, sometimes also due to vacuum and steam; Eliahu Rosenberg, Tatsachenbericht, Jewish Historical Documentation, Dec. 24, 1947, p. 4: mass murder with Diesel engine exhaust within 20-35 minutes (published in H. P. Rullmann, Der Fall Demjanjuk, Verlag für ganzheitliche Forschung und Kultur, Struckum 1987, pp. 133-144); World Jewish Congress et al. (eds. ), The Black Book: The Nazi Crime Against the Jewish People, New York 1946; reprint by Nexus Press, New York 1981: no fewer than 3 million victims in Treblinka due to carbon monoxide from tank engines, sometimes also due to vacuum and steam. W. Braker, A. L. Mossman, Effects of Exposure to Toxic Gases, Matheson Gas Products, East Rutherford 1970, p. 12; 2nd ed., D. Siegel, Lynhurst, N.J., 1977. According to the eyewitness statements in E. Kogon, H. Langbein, A. Rückerl et al. (eds. ), Nationalsozialistische Massentötungen durch Giftgas, Fischer, Frankfurt/Main 1986, p. 159 (E. Fuchs, 10 mins. ), p. 167 (K.A. Schluch, 5-7 mins. ), p. 174 (K. Gerstein, 18 mins. ), p. 181 (A. Goldfarb, 20-25 mins. ), the gassing procedure allegedly sometimes took much less time; in accordance with Gerstein: Matthes, in H. P. Rullmann, op. cit. (note 23), p. 167: 30 min. F. E. Camps, Medical and Scientific Investigations in the Christie Case, Medical Publications Ltd., London 1953, p. 170. Y. Henderson, H. W. Haggard, Noxious Gases, Reinhold Publishing, New York 1943, p. 168. P. S. Myers, "Automobile Emissions - A Study in Environmental Benefits versus Technological Costs", Society of Automotive Engineers Transactions 79 (1970), section 1, paper 700182, p. 662. Keith Simpson (ed. ), Taylor's Principles and Practice of Medical Jurisprudence, J. & A. Churchill, London 1965, pp. 366f. ; Graph 2 originally appeared in K. Simpson, R.A. Furbank, Journal for Medicine, 2 (1995), p. 5. Hb� CO - hemoglobin-carbon monoxide compound, the compound formed by CO and blood hemoglobin, whereby the oxygen (Hb� O2, oxyhemoglobin) becomes displaced. The Soviets used gasoline engines in some of their tanks (models BT, T 28, T 35). Soviet Diesel engines first appeared in 1939 in the T-34 Stalin tank and surprised everyone outside the Soviet Union at the beginning of the German-Soviet war (The heavy tanks KW Ia and KW II had Diesel engines, too). The heavy Diesel engine of the T 34, model "W2", was a V12 cylinder Diesel (undivided chamber) with 550 hp, 38.86 l cubic capacity and a maximum 1900 rpm; cf. Augustin, Motortechnische Zeitschrift 5(4/5) (1943), pp. 130-139; ibid., 5(6/7) (1943), pp. 207-213; ibid., 6(1/2) (1944), p. 40; and H. Scheibert, Der russische Kampfwagen T-34 und seine Abarten, Podzun-Pallas Verlag, Friedberg 1988. Diesel engines from submarines are also mentioned: Jochen von Lang, Eichmann Interrogated, Farrar, Strauss & Giroux, New York 1983, p. 75 (German ed. : Das Eichmann-Protokoll, Severin und Siedler, Berlin 1982, p. 72), mentions a Russian submarine; see also Hannah Arendt, Eichmann in Jerusalem, Reclam-Verlag, Leipzig 1990, p. 181, who quotes a statement Eichmann made during the trial. Alleging the use of a large submarine engine in the heart of Poland is ridiculous. Marine engines are invariably far, far heavier than comparable horsepower automotive engines to achieve reliable, continuous, long-term service. In Germany as well, the emission levels from Diesel engines have always been below the threshold values set by the Federal Emissions Regulation. This is why Diesels were the only kind of engine to be exempt from the mandatory use of catalytic converters until 1994. David F. Merrion, "Effect of Design Revisions on Two Stroke Cycle Diesel Engine Exhaust", Society of Automotive Engineers Transactions 77 (1968), paper 680422, p. 1535. Over the years, a number of exterminationists have falsely speculated that Diesels could simply be adjusted somehow by perhaps turning a screw somewhere or by changing the injection timing to give high CO emission levels. If it were so easy it would be of great concern to auto emission inspectors but it is of no concern at all. The excess air in the cylinders and exhaust drives the combustion process toward near perfection. There is no basis anywhere in the automotive literature for such an exterminationist argument. Let the exterminationists try to find such evidence in the literature or anywhere else. The EPA will be extremely interested. In the past 50 years the data used for Graphs 4 and 5 have been repeatedly used in the technical literature by numerous engineers. This shows, on the one hand, how reliable the data are that were used for this graph. On the other hand it also underlines the nature of this data as the worst possible emission curves of Diesel engines. Two earlier works which drew on this data are: H. H. Schrenk, L. B. Berger, "Composition of Diesel Engine Exhaust Gas", American Journal of Public Health 31(7) (1941), p. 674; and Martin A. Elliott, "Combustion of Diesel Fuels", Society of Automotive Engineers Quarterly Transactions 3(3) (1949), p. 509. The earlier exception for coal mines arose not from true health and safety considerations but from the political pressure of the United Mine Workers Union which saw all liquid fuels as a threat to job security. Diesel locomotives had cost the UMWA thousands of jobs. Electrically-driven vehicles and equipment, with lengthy power cables, derived their energy from coal burned in electric power plants and were, therefore, entirely acceptable to the union. S.O. Ogden "The war over Diesels," Coal Mining & Processing, June 1978, p. 102. Data taken from: M. A. Elliott, R. F. Davis, op. cit. (note 34), p. 333. D. Pankow, Toxikologie des Kohlenmonoxids, VEB Verlag Volk und Gesundheit, Berlin (East) 1981, p. 24, also states that Diesel engines under full load do not produce more than 0.4% CO by volume. Edward F. Obert, Internal Combustion Engines and Air Pollution, Intext Educational Publishers, New York 1973, p. 361. Y. Henderson, H. W. Haggard, op. cit. (note 42), pp. 144-145. J. S. Haldane, J. G. Priestley, Respiration, Yale UP, New Haven 1935, pp. 223-224. Note: The composition of exhaust gasses is almost independent from the rpm's of the engine. The rpm's simply determine how much gas is produced. If the rpm's are lower, for the same fuel/air ratio the whole process will take longer. Based on the data from Graphs 4 and 5. One objection to my 1984 essay was that I had not properly considered the combined effects of carbon monoxide and reduced oxygen. If one determines an "effective carbon monoxide level," as explained in this text, one will see that there is no significant increase in toxicity for half-hour exposures due to reduced oxygen until one gets the engine running under heavy loads which is exactly what I claimed in 1984. L.J. Meduna, Carbon Dioxide Therapy, C. C. Thomas, Springfield 1958, pp. 3-19. J.D.P. Graham, The Diagnosis and Treatment of Acute Poisoning, Oxford UP, London 1962, pp. 215-217. L.T. Fairhall, Industrial Toxicology, Williams & Wilkins, Baltimore 1957, p. 180. M. Daunderer, Klinische Toxikologie, 32nd supplement 21/87, ecomed, Landsberg 1987, p. 1. J.M. Arena, Poisoning: Toxicology - Symptoms - Treatments, C. C. Thomas, Springfield 1979, p. 243; J.D.P. Graham, op. cit. (note 48), p. 216. W. Forth et al., op. cit. (note 22), pp. 760ff. ; M. Daunderer, Klinische Toxikologie, 33rd supplement 1/88, ecomed, Landsberg 1988, pp. 1ff. W. Forth et al., op. cit. (note 22), pp. 761, 765; M. Daunderer, Klinische Toxikologie, 34th supplement 2/88, ecomed, Landsberg 1988, pp. 1ff. Cf. R.E. Pattle, H. Stretch, F. Burgess, K. Sinclair, J.A.G. Edginton, Brit. J. industr. Med. 14 (1957) pp. 47-55, here p. 50. This study was brought to the author's attention by Charles D. Provan an independent researcher who still believes in Nazi gassings. I referred to this possibility and to this source in 1994 for the first time: F.P. Berg, "Die Diesel-Gaskammern: Mythos im Mythos", in Ernst Gauss (ed. ), Grundlagen zur Zeitgeschichte, Grabert, Tübingen 1994, pp. 321-345. J. Falbe, M. Regitz (eds. ), Römpp Chemie Lexikon, v. 5, Thieme, Stuttgart 1992, pp. 4314f. M. A. Elliott, R. F. Davis, op. cit. (note 39), p. 345. R. Kühn, K. Birett, Merkblätter Gefährlicher Arbeitsstoffe, 69th supplement 11/93, Technische Regeln für Gefahrstoffe (TRGS) 554: "Dieselmotoremissionen", ecomed, Landsberg 1993; ibid., 61st supplement 9/92, TRGS 102, Technische Richtkonzentrationen (TRK) für gefährliche Stoffe, pp. 93ff. ; L. Roth, M. Daunderer, Giftliste, 23rd supplement 2/86, TRGS 102, ecomed, Landsberg 1986, pp. 51ff. Cf. the experiment by R. E. Pattle et al., op. cit. (note 54). It is interesting to note that some people cite this data as proof that it is possible to attain high CO-levels with Diesel engines: cf. Martin Pägert, (www.eikon.e-technik.tu-muenchen.de/~rwulf/leuchter/leucht19.html). What is not mentioned, however, is that this is possible only with special, gaseous fuels, not with Diesel fuel. H.H. Müller-Neuglück, H. Werkmeister, "Grubensicherheit der Diesellokomotiven", Glückauf, Aug. 23, 1930, p. 1145. S. Gilbert, "The Use of Diesel Engines Underground in British Coal Mines", The Mining Engineer (GB), June 1974, p. 403. Dennis S. Lachtman, "Diesel Exhaust - Health Effects", Mining Congress Journal, January 1981, p. 40. Mine Safety & Health Administration. Other obvious falsehoods within his 'statement' may have been intended to serve the same purpose. He may have simply wanted a cover story to save himself without providing any long term comfort to Germany's enemies. His own role in the SS with the application of Zyklon B, albeit for life saving work, would have given him additional reason to be fearful about his own future. Eran Sher (ed. ), Handbook of Air Pollution from Internal Combustion Engines: Pollution Formation and Control, Boston, San Diego, New York, London, Sydney, Tokyo, Toronto: Academic Press, 1998, p. 288. See for this Arnulf Neumaier, "The Treblinka Holocaust", this volume; cf. also Yoram Sheftel, The Demjanjuk Affair. The Rise and Fall of the Show Trial, Victor Gollancz, London 1994. When testing the emissions of Diesel engines, German engineers sometimes impose load on the engine without coupling any equipment by simply opposing the inertia of the engine. Accelerating an engine with the fuel pedal depressed and with no load increases the engine speed rapidly and the fuel/air ratio as well, but only for a few seconds. This may suffice to measure the engine's exhaust composition at high fuel/air ratios, but if the cylinder wall temperatures are still unusually low, this may give erroneous test result. E. Fuchs, in E. Kogon et .al. (eds. ), op. cit. (note 25), p. 163: "[...] I set up a light machine in the extermination camp there, so that the barracks can be lit electrically [...]"; E. Roosevelt, A. Einstein et al. (eds. ), The Black Book of Polish Jewry, Roy Publishers, New York 1943, pp. 142ff. : murder by means of steam, Diesel engines for supplying power. Cf. also A. Donat (ed. ), The Death Camp Treblinka, Holocaust Library, New York 1979, p. 157, as well as the verdict of the Düsseldorf District Court in the Treblinka Trial, Ref. 8 I Ks 2/64, p. 300; Y. Arad, op. cit. (note 17), p. 42. Kostenüberschlag über Notstromaggregate für K.G.L., Central Construction Office of the Waffen-SS and Police of Auschwitz, O./S., Oct. 26, 1942. Engine size certainly determines the total amounts of pollutants, toxic or otherwise that an engine will produce, but it has no bearing on the concentrations of those pollutants in the exhaust. It is the concentrations which are the critical consideration and not the total amounts of pollutants once levels have stabilized inside the gas chamber. A large engine will fill a potential gas chamber quicker than a small engine, but that is all. Concentrations within the chamber will never exceed the levels measured directly in the engine's exhaust. Diesel engines have never used carburetors (all gasoline engines did until recently), and hence no idle-mixture adjustment screws which were always part of the carburetors and allowed fuel/air ratios to be easily maladjusted. For this reason, Pattle et al. (note 54) went to the round-about-method of 'choking' rather than purchasing a suitable brake dynamometer, which suggests just how difficult it was to get such devices even in a postwar environment. The choking employed was extreme: the air intake was restricted to less than 21/2% of its normal size, which caused engine misfiring during warm-up. R. E. Pattle et al. made two experiments with that setting, one resulting in only 0.12% CO, the other in 0.22% CO; no reason was given; CO2 was between 2.34% and 3.58%; op. cit. (note 54), pp. 49f. For another discussion of the same material see: Conrad Grieb "Holocaust: Dieselmotorabgase töten langsam," Vierteljahreshefte für freie Geschichtsforschung 1(3) (1997), pp. 134-137 (online: vho.org\VffG\1997\3\Grieb3.html). For a detailed analysis of the gas chamber claims for Treblinka, see C. Mattogno, J. Graf, Treblinka. Vernichtungslager oder Durchgangslager? Castle Hill Publishers, Hastings 2002, pp. 145-151, also in particular the Soviet 'gas chamber' plan on page 397; Engl. : Treblinka. Extermination Camp or Transit Camp? Theses & Dissertations Press, Chicago 2003. Cf. A. Donat (ed. ), op. cit. (note 68), pp. 34, 157ff., and the Treblinka verdict of Düsseldorf, ibid., p. 300ff. ; Y. Arad, op. cit. (note 17), p. 119f. ; J.-F. Steiner, Treblinka, Stalling, Oldenburg 1966, p. 173. Regarding the engine type, cf. note 31. J.-F. Steiner, op. cit. (note 74), p. 173, speaks of 200 people per chamber. J. Wiernik (in A. Donat, op. cit. (note 68), p. 161), on the other hand, fantasizes about 1,000 to 1,200 per chamber, whose area he gives as 7 � 7 m, in other words more than 20 people per square meter. Y. Arad, op. cit. (note 17), pp. 120f., puts a maximum of 380 but an actual estimate of up to 300 people into each chamber, and at times speaks of only 6 chambers, not 10. Augustin, Motortechnische Zeitschrift 5(4/5) (1943), pp. 130-139. The resultant excess pressure would have exploded the chamber after only a few minutes; cf. the chapter by A. Neumaier in this volume. Assuming a linear increase in the CO content. W.F. Marshall, R.W. Hurn, "Hazard from Engines Rebreathing Exhaust in Confined Space", U.S. Department of the Interior, Bureau of Mines, Report of Investigations 7757, 1973, pp. 7-10. H. Bour, I. McA. Ledingham, Carbon Monoxide Poisoning, Elsevier, Amsterdam 1967, p. 2. W. Oerley, "Entwicklung und Stand der Holzgaserzeuger in Österreich, März 1938", Automobiltechnische Zeitschrift 11 (1939), p. 314. The German technical automotive literature of that time is chock full of material about this technology that has been so completely forgotten today. For an introductory overview, cf. Automobiltechnische Zeitschrift 18 (1940) and 18 (1941). Cf. also E. Eckermann, Alte Technik mit Zukunft: Die Entwicklung des Imbert-Generators, Oldenbourg, Munich 1986. H. Fiebelkorn, Behandlung und Instandsetzung von Fahrzeug-Gaserzeugeranlagen, W. Knapp, Halle 1944, p. 189; cf. 2nd ed., ibid., 1948. Walter J. Spielberger, Kraftfahrzeuge und Panzer des österreichischen Heeres 1896 bis heute, Motorbuch Verlag, Stuttgart 1976, pp. 207, 213. Cf. the chapter by I. Weckert, this volume. A. Hitler, July 15, 1940, quoted from W. Ostwald, Generator-Jahrbuch, 1942, J. Kasper & Co., Berlin 1943, p. 79. W. Ostwald, op. cit. (note 86), pp. 41f. E. Eckermann, op. cit. (note 82). E. Hafer, Die gesetzliche Regelung des Generatoren- und Festkraftstoff-Einsatzes im Großdeutschen Reich, J. Kasper & Co., Berlin 1943, p. 15. Letter from H. Göring to the Reich Economic Minister, the Reich Transportation Minister, the Commanders-in-Chief of the Wehrmacht units, the Chief of the Wehrmacht Supreme Command, the Reich Ministers for Armament and Munition as well as for the occupied eastern territories, according to E. Hafer, op. cit. (note 89), p. 17. Motortechnische Zeitschrift, Nr. 6/7, 1943, p. 3A. E. Hafer, op. cit. (note 89), p. 36. E. Hafer, op. cit. (note 89), supplement, p. 35a. U.S. Strategic Bombing Survey, The German Oil Industry Ministerial Report Team 78, War Department, Washington, D.C., 1947, p. 73. More than likely these were training tanks (Schulungspanzer) drafted into combat during the last months of the war. L. Gassner, "Verkehrshygiene und Schädlingsbekämpfung", Gesundheits-Ingenieur 66(15) (1943), p. 175. "S" stood for "standard" as in standard drive via the rear wheels, as opposed to the "A" vehicles with all-wheel drive, and the special or "Sonder" vehicles abbreviated as "Sd.-Kfz"; all vehicles such as tanks, for example, had their own Sonder class numbers. Another spezial class was designated with a lower case "s." cf. W. Spielberger, Spezial-Panzer-Fahrzeuge des deutschen Heeres, Motorbuch-Verlag, Stuttgart 1977, pp. 153f. ; W. Spielberger, Die Halbkettenfahrzeuge des deutschen Heeres, 2nd ed., ibid., 1984, pp. 170f. ; W.J.L. Davies, German Army Handbook 1939-1945, Arco, New York 1981, p. 90. In other words, the German designations had nothing whatever to do with any sinister cover-up as Hilberg and others have often alleged. All Saurer Diesel engines employed, even before the war, a swirl chamber (Doppelwirbelkammer) machined into the top of each piston. This design had been unused for many years after the war and after the demise of the Swiss Saurer. However, the concept has been revived as "bowel in piston" by Audi and is now used widely in the most advanced Diesel engines of VW and Mercedes Benz to help meet the most stringent environmental emissions standards; see John B. Heywood, Internal Combustion Engine Fundamentals, McGraw-Hill, 1988. Of all the Diesels available, the Saurer designs were the least likely to have served as any kind of source for toxic emissions. The Trial in the Case of the Atrocities Committed by the German Fascist Invaders and their Accomplices in Krasnodar and Krasnodar Territory, July 14 to 17, 1943, Foreign Languages Publishing House, Moscow 1943. The People's Verdict, Hutchinson & Co., London, 1944, page 43. Nürnberger Dokument PS-501; cf. I. Weckert in this volume. Aage Grut, Chronic Carbon Monoxide Poisoning, Ejnar Munksgaard, Copenhagen 1949, p. 69. See also Leo Noro, "Über die durch Motorabgase verursachten Kohlenoxydvergiftungen bei der Mannschaft von Panzerformationen", Acta Medica Scandinavica, CXXI(IV) (1945); K. v. Bagh, "Neurologisch-psychiatische Gesichtspunkte zur Diagnostik und Behandlung der chronischen Generatorgasvergiftungen", Annales Medicinae Internae Fenniae, Vol. 35, 1946. E. W. Baader, Gewerbekrankheiten, Munich/Berlin 1954, pp. 178-184. Cf. esp. : W. Gumz, J. F. Foster (Battelle Memorial Institute), "A Critical Survey of Methods of Making a High BTU Gas from Coal", Research Bull. No. 6, American Gas Association, New York 1953; further detailed references are given there. U. S. Strategic Bombing Survey, Oil Division Final Report, War Department, Washington, D.C., 1947, p. 1 [retrans. from German trans.]. Cf. the chapter by G. Rudolf, this volume, as well as F. P. Berg, "Typhus and the Jews", JHR 8(4) (1988), pp. 433-481 (online: vho.org/GB/Journals/JHR/8/4/Berg433-481.html); F. P. Berg, "The German Delousing Chambers", JHR 7(1) (1986), pp. 73-94 (online: codoh.com/gcgv/gcgvtyph.html). E. Kogon et al. (eds. ), op. cit. (note 25). Chicago Jewish Sentinel, Dec. 22, 1983. E. Kogon et al. (eds. ), op. cit. (note 25), pp. 171f. Another claim in this book which indicates gasoline engines is that of E. Fuchs, from 1960: "It was a heavy Russian gasoline engine (presumably a tank or tractor engine) with at least 200 hp (V-engine, 8 cylinders, water-cooled)", p. 158, excerpted from papers of the Dortmund Public Prosecutor's Office, Ref. 45 Js 27/61 (Ref. ZSL: 208 AR-Z 251/59, v. 5, fol. 988). However, the Soviets only used Diesel engines for their powerful tank engines, cf. note 31. Testimony by Prof. W. Pfannenstiel, around 1960, excerpted from papers of the Munich I Public Prosecutor's Office, Ref. 22 Js 64-83/61 (Ref. ZSL: 208 AR-Z 252/59, v. 1, fol. 135ff. ), quoted from: E. Kogon et al., op. cit. (note 25), p. 173. Cf. note 21. E.g., his testimony on June 6, 1950, before a Darmstadt court, quoted from Saul Friedländer, Counterfeit Nazi: The Ambiguity of Good, Weidenfeld and Nicolson, London 1967, p. 118; cf. also, e.g., K. A. Schluch, around 1960, excerpted from documents of the Munich I Public Prosecutor's Office, Ref. 22 Js 64-83/61 (Ref. ZSL: 208 AR-Z 252/59, v. VIII, fol. 1511), quoted from: E. Kogon et al. (eds. ), op. cit. (note 25), p. 168; cf. A. Rückerl (ed. ), Nationalsozialistische Vernichtungslager im Spiegel deutscher Strafprozesse, dtv, Munich 1978, p. 142; for a more in-depth analysis of the dilemma faced to this day by every German who ever had anything even remotely to do with one of the camps - Treblinka, Belzec and Sobibor were in fact more transit camps than concentration camps - see W. Lindsey, op. cit. (note 13), as well as the chapter by M. Köhler, this volume. E. Jäckel, P. Longerich, J. H. Schoeps (eds. ), Enzyklopädie des Holocaust, 3 vols., Argon, Berlin 1993, entries for "Aktion Reinhard", v. 1, p. 15 "Benzin oder Dieselmotoren" (Gasoline or Diesel Engines), "Belzec", v. 1, p. 176 "Dieselmotor mit 250 PS" (Diesel engine with 250 hp), "Sobibor", v. 3, p. 1332 "200 PS-Motor" (Engine with 200 hp), "Treblinka", v. 3, p. 1428 "Dieselmotor" (Diesel engine), "Gaskammer" (Gas chamber), v. 1, p. 505 "Dieselauspuffgas [...] in den Vernichtungslagern im Generalgouvernement" (Diesel exhaust ... in the extermination camps in the General Government) and "Vernichtungslager" (Extermination camps), v. 3, p. 1496: "These extermination camps [Belzec, Sobibor, Treblinka] used carbon monoxide gas produced by Diesel engines." According to this source, the Sobibor camp (250,000 victims) is the only case where there is any uncertainty regarding the engine type. In Belzec (600,000 victims) and Treblinka (700,000 to 1,200,000 victims) they were definitely Diesel engines. Jerusalem District Court, Criminal Case No. 373/86, verdict against Ivan (John) Demjanjuk, p. 2: "Diesel motors", p. 7: SU-tanks: V12 Diesel engines with 500/550 hp. A. Rückerl (ed. ), op. cit. (note 111), pp. 61, 64, 133 (re. Belzec); 203f., 226 (re. Treblinka); regarding Sobibor there is talk of gasoline engines: pp. 108, 165, 200; cf. the verdict of the Munich I District Court, Ref. 110 Ks 3/64 (Belzec) and the verdicts of the Düsseldorf District Court, Ref. 8 I Ks 2/64 and 8 Ks 1/69 against K. Franz and F. P. Stangl (both Treblinka), in H. Lichtenstein, Im Namen des Volkes?, Bund, Cologne 1984, pp. 187f. (death after 15 minutes due to Diesel exhaust gas in gas-tight chamber in Belzec), p. 201 (3 screwed-down Diesel engines in Treblinka). The chemist J. Bailer also fervently defends the Diesel version, although he plays with a stacked deck, cf. note 6. The same goes for Martin Pägert, op. cit. (note 59). Y. Manin, Novoje Russkoje Slowo, February 26-29, 1995; regarding more details about this article: M. Dragan, "Revisionisten haben Luftüberlegenheit", Vierteljahreshefte für freie Geschichtsforschung, 1(3) (1997), p. 138 (online: vho.org/VffG/1997/3/Dragan3.html).